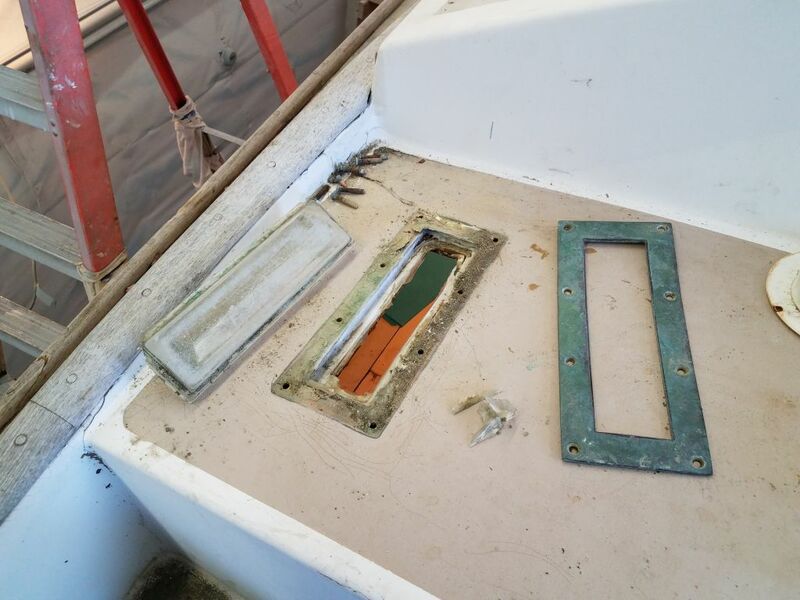 Finishing up some last hardware installations, I removed the port deck prism from above the galley. 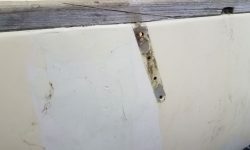 Like its counterpart to starboard, the prism had some damage, and the deck around and spreading widely from the opening was badly deteriorated. 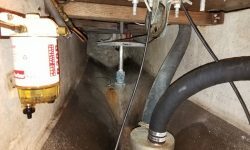 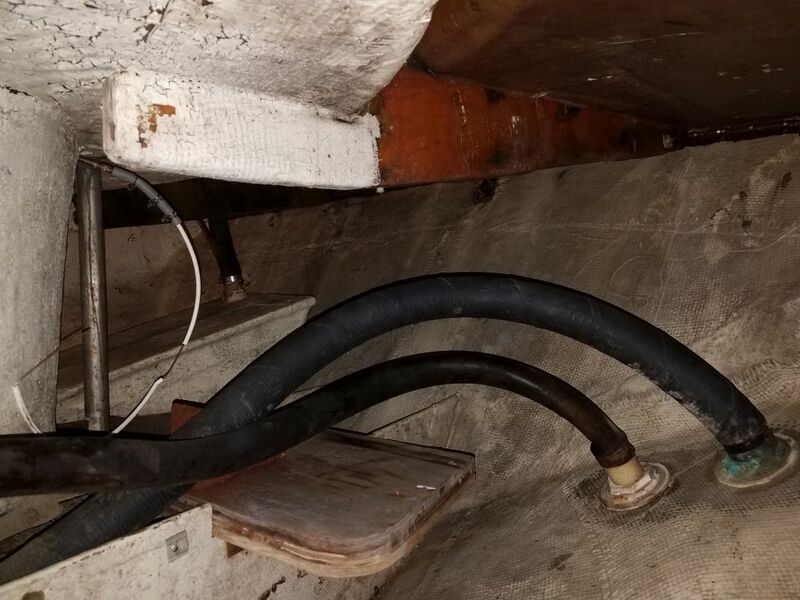 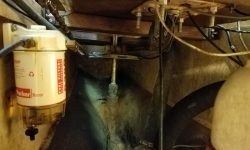 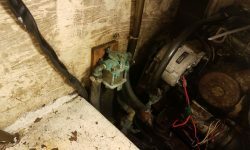 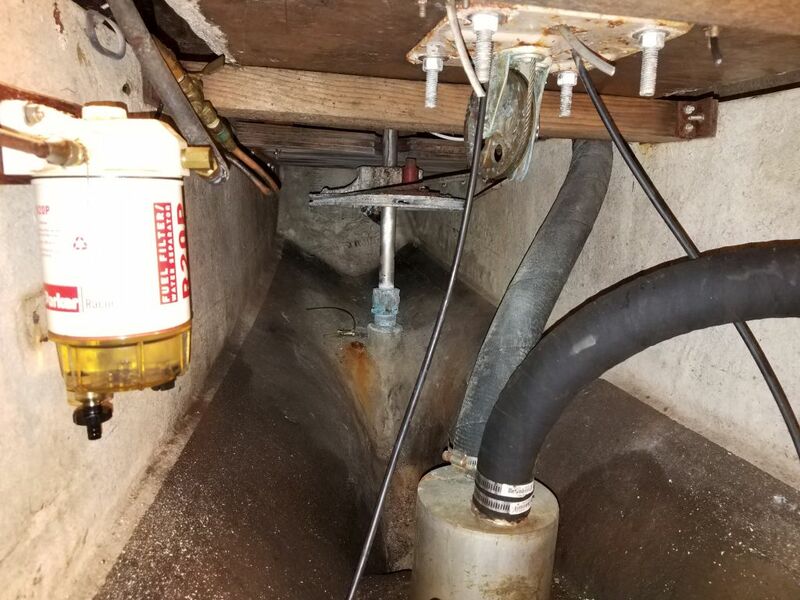 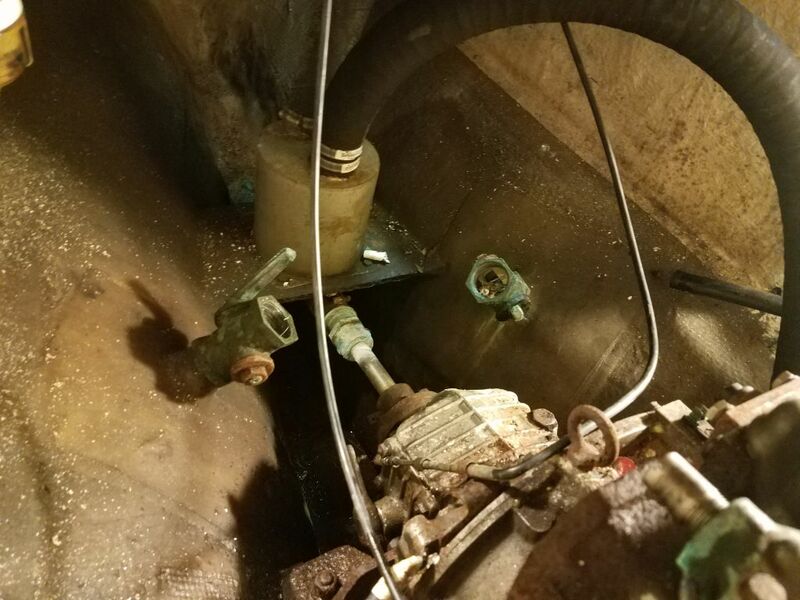 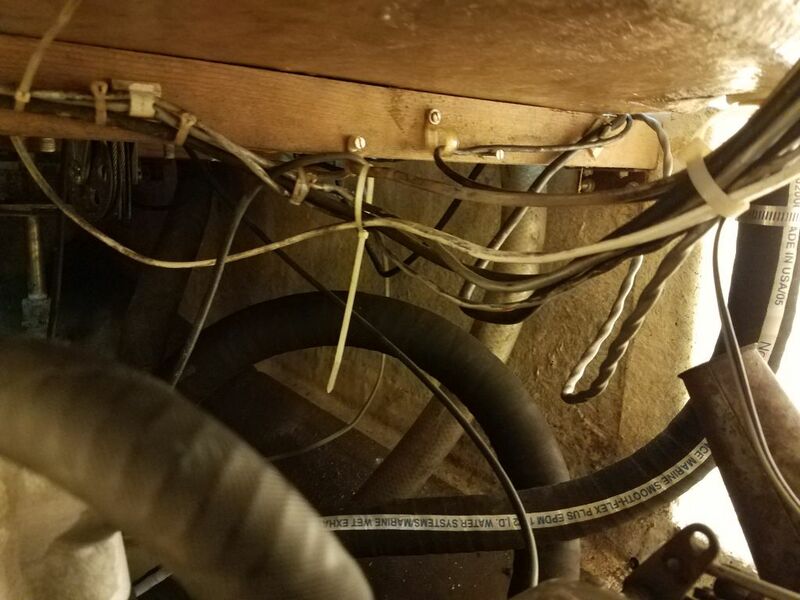 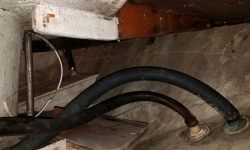 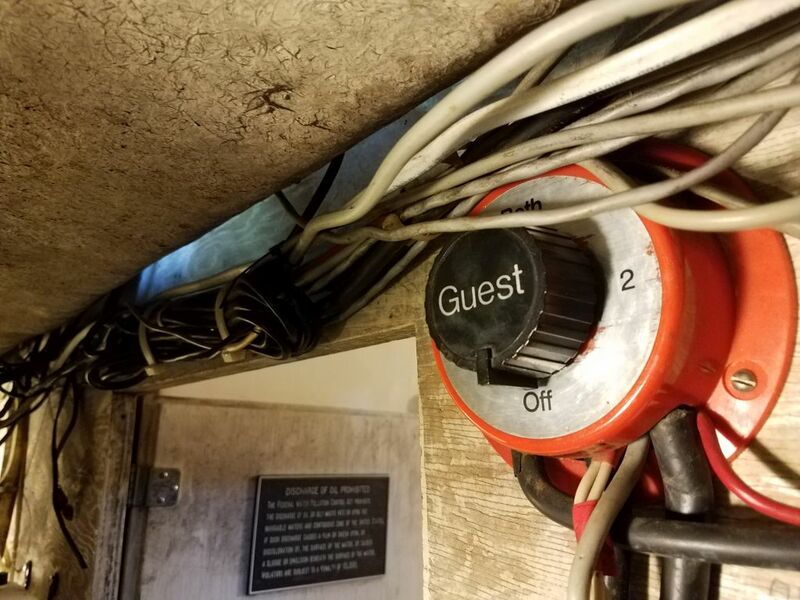 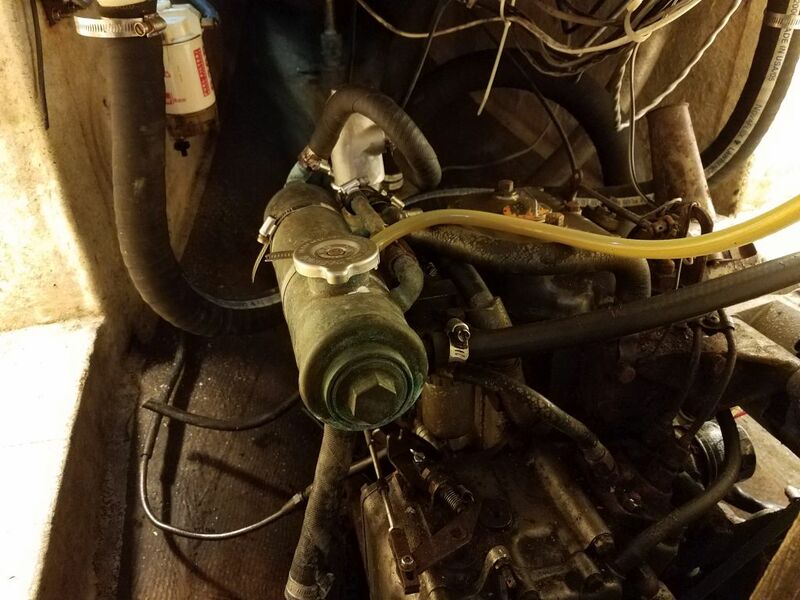 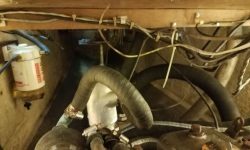 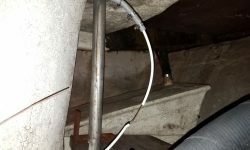 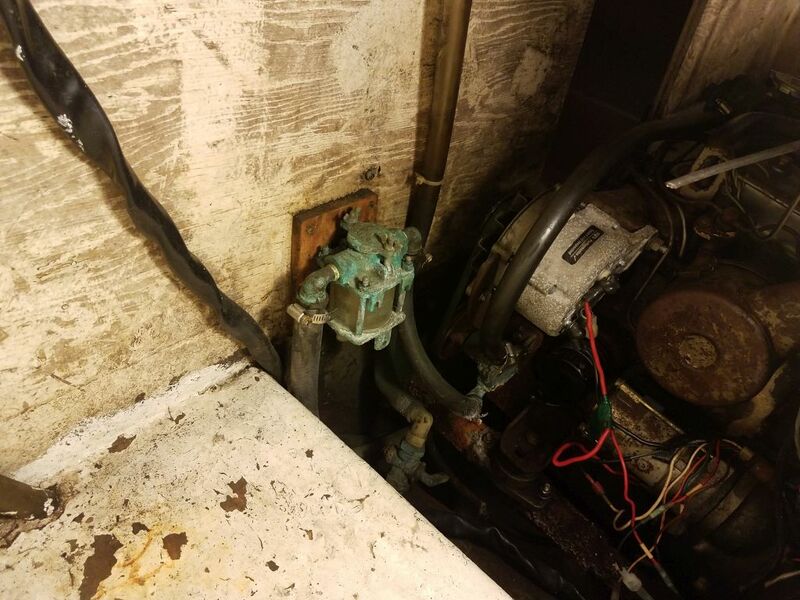 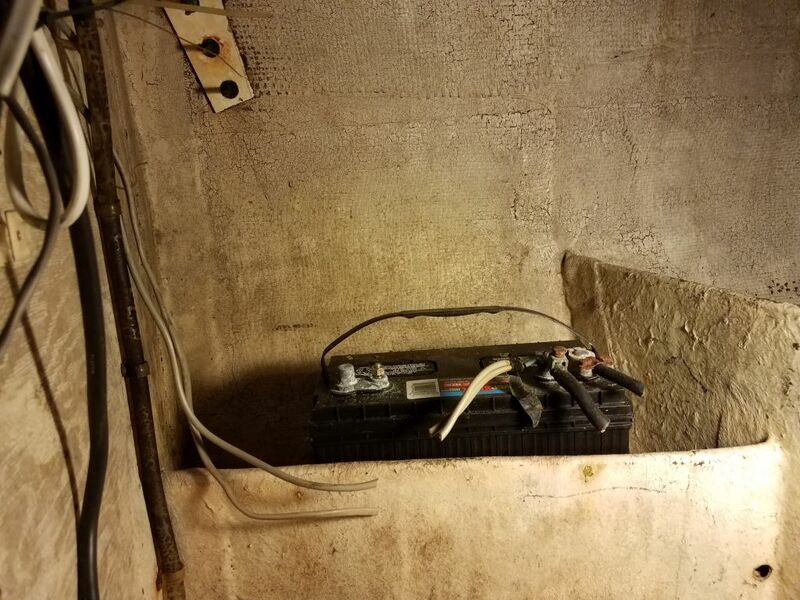 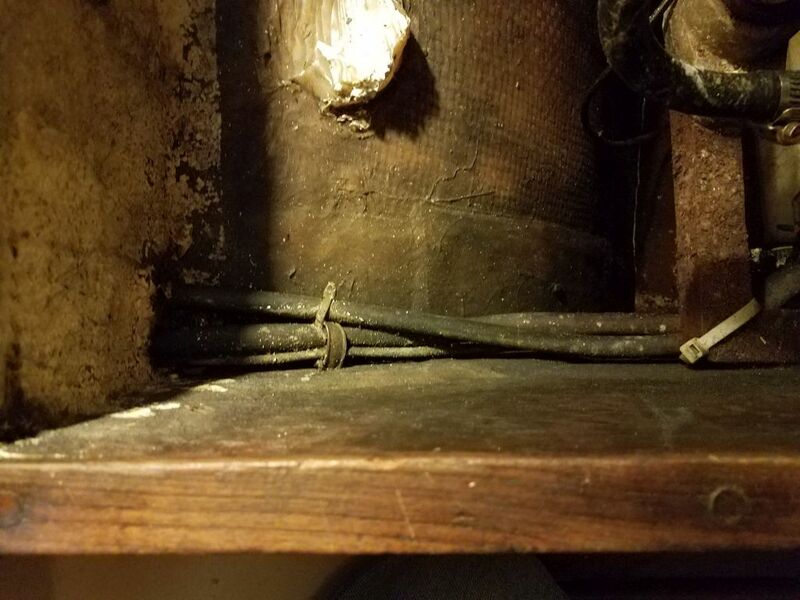 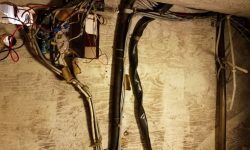 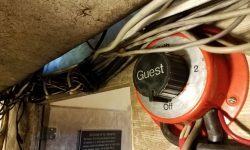 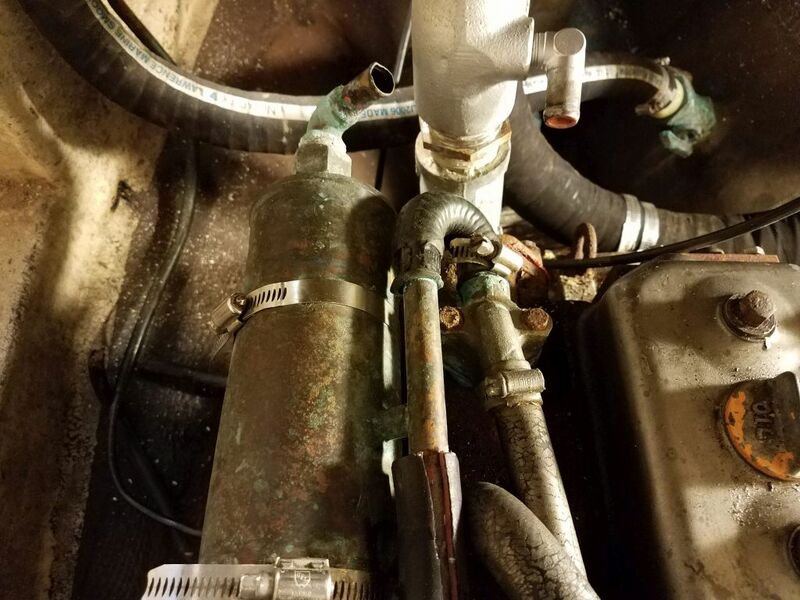 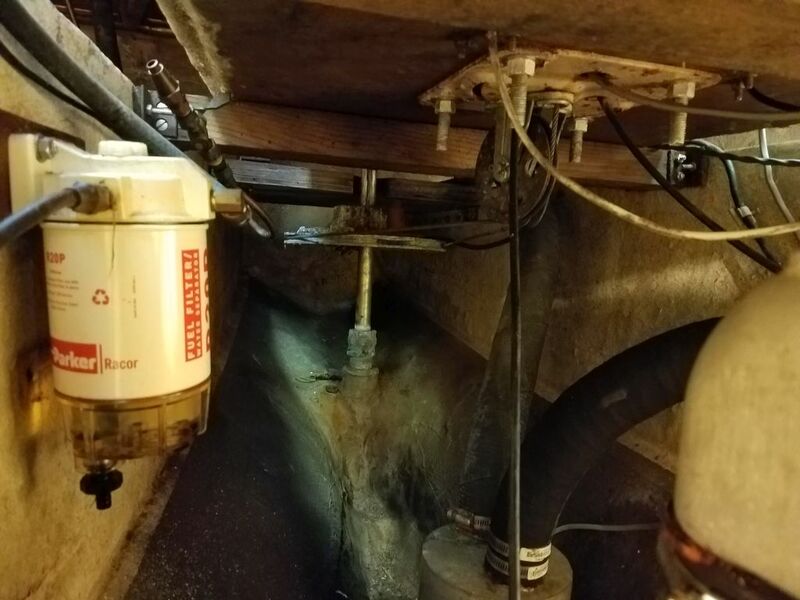 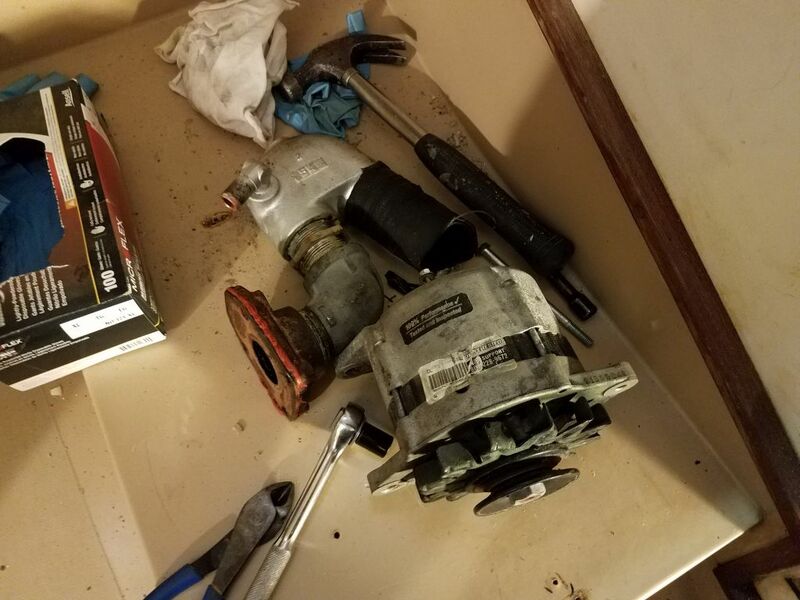 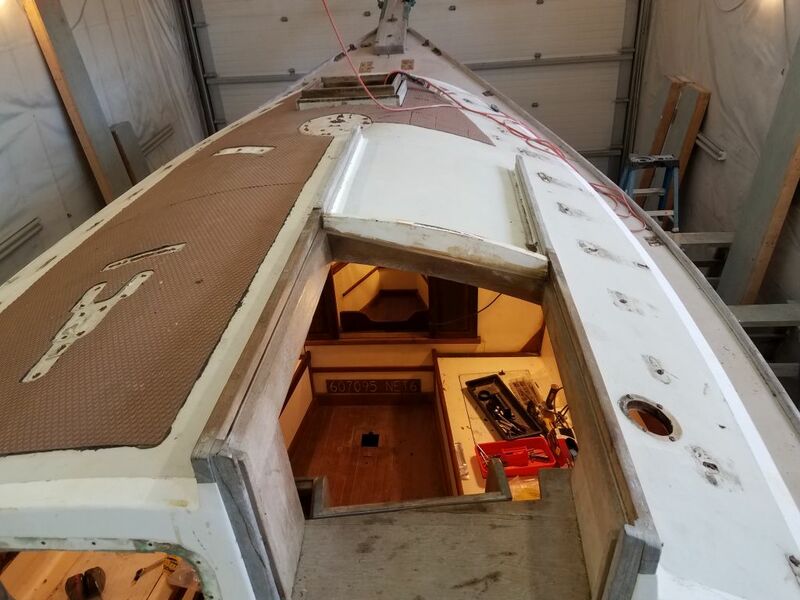 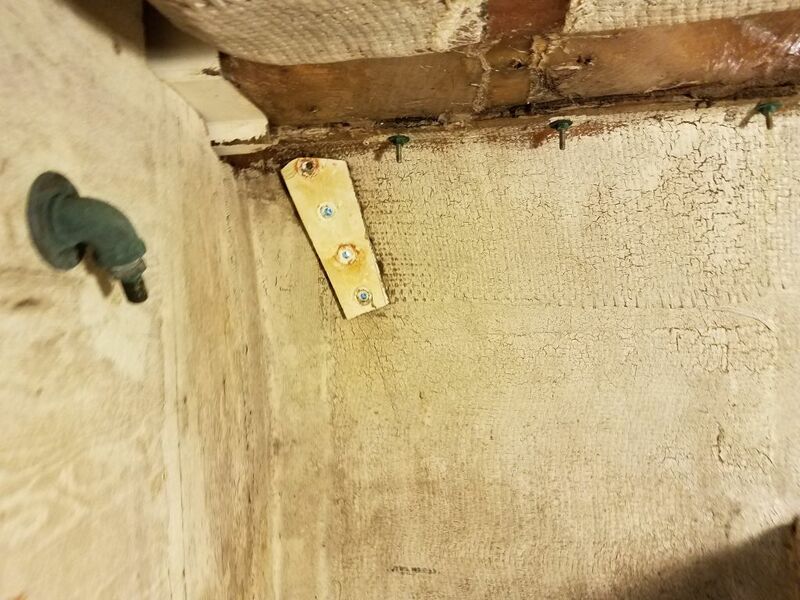 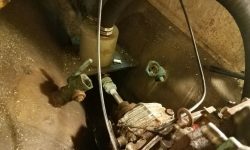 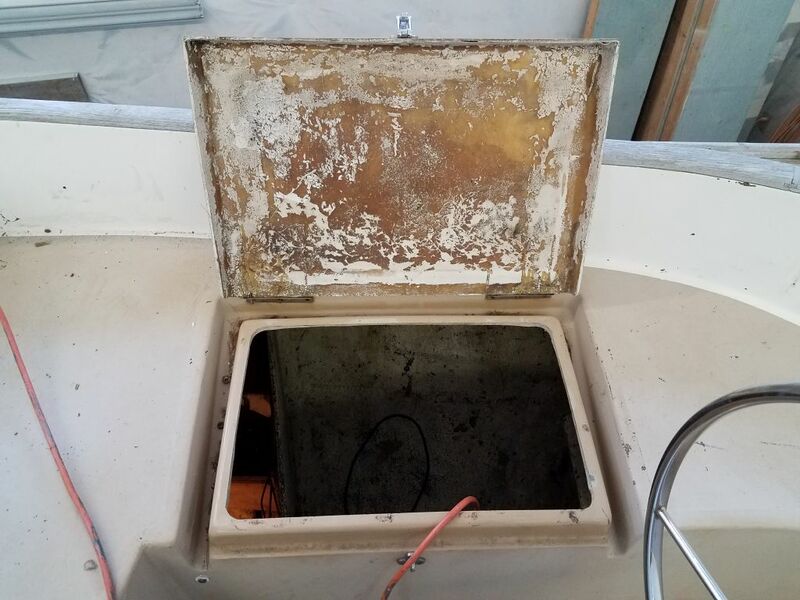 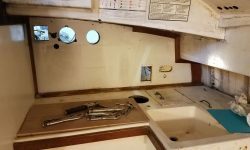 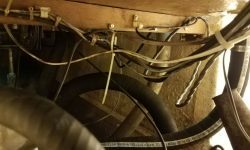 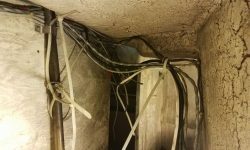 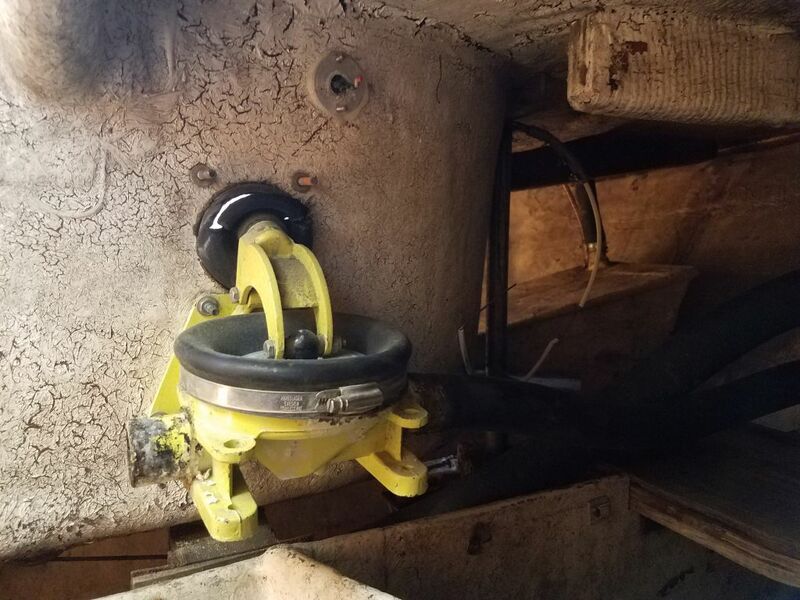 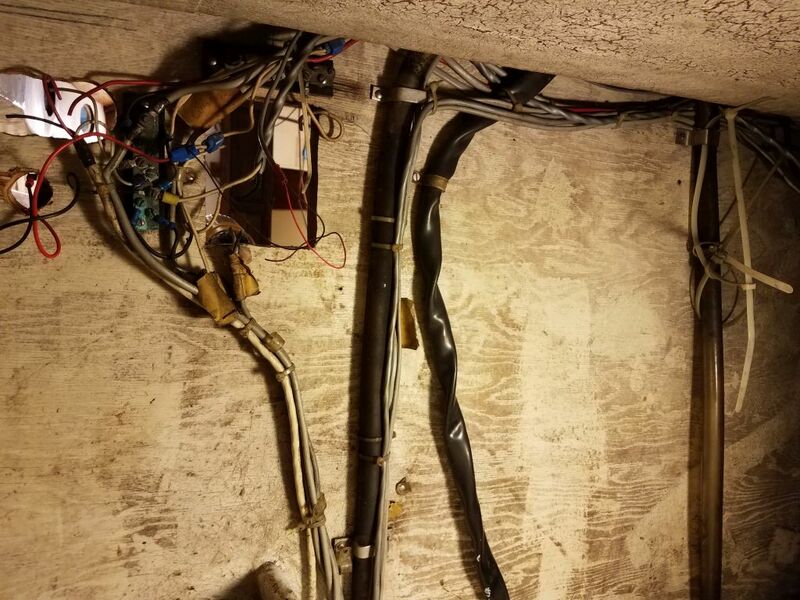 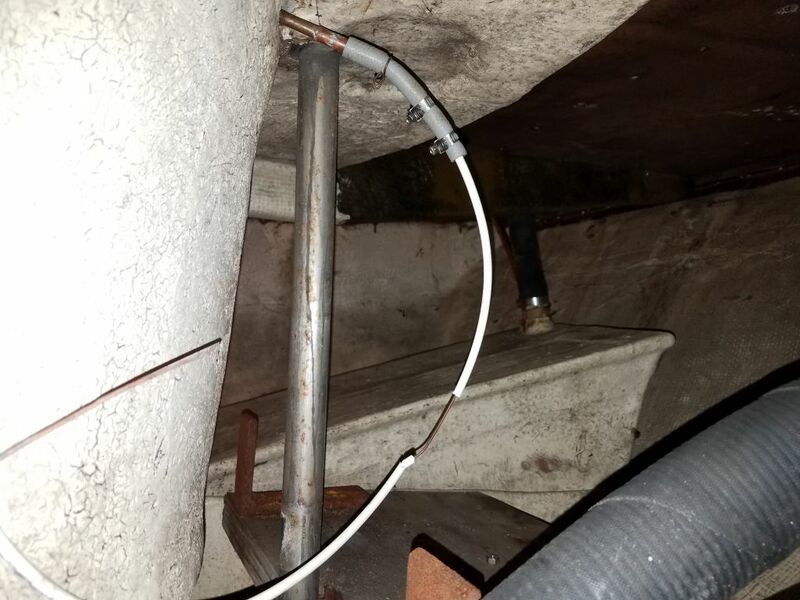 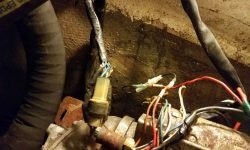 Beneath the galley, I clipped off the wiring harnesses and removed the remaining water supply hose and little electric pump, mainly clearing the space for now. 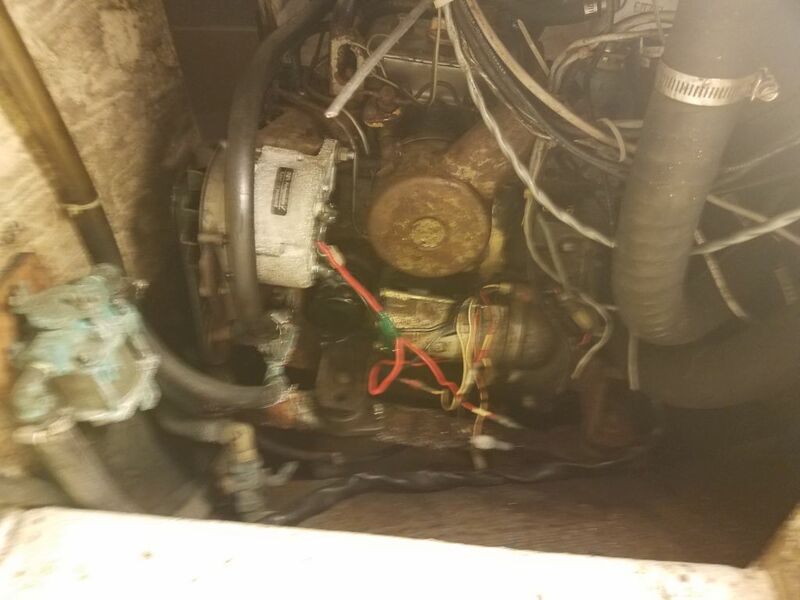 I’d pull out the wire and hose remnants from the engine room a little later, once I got to work back there. 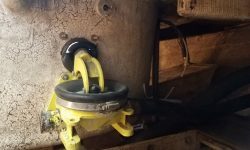 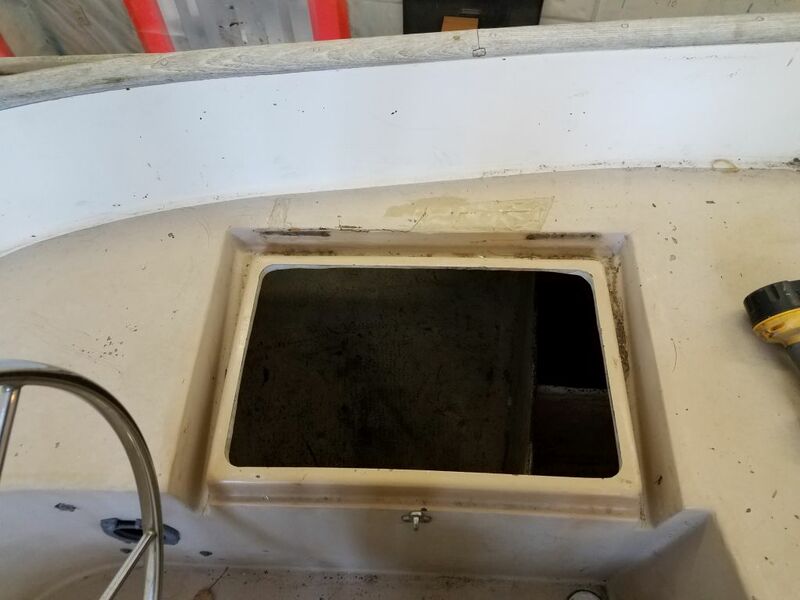 The galley sink drain seacock was frozen closed, at least without a tool to move the valve, and in any event through hull replacement was on the work list for the project. 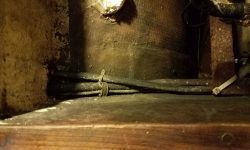 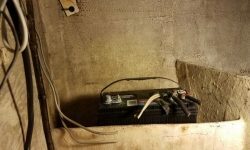 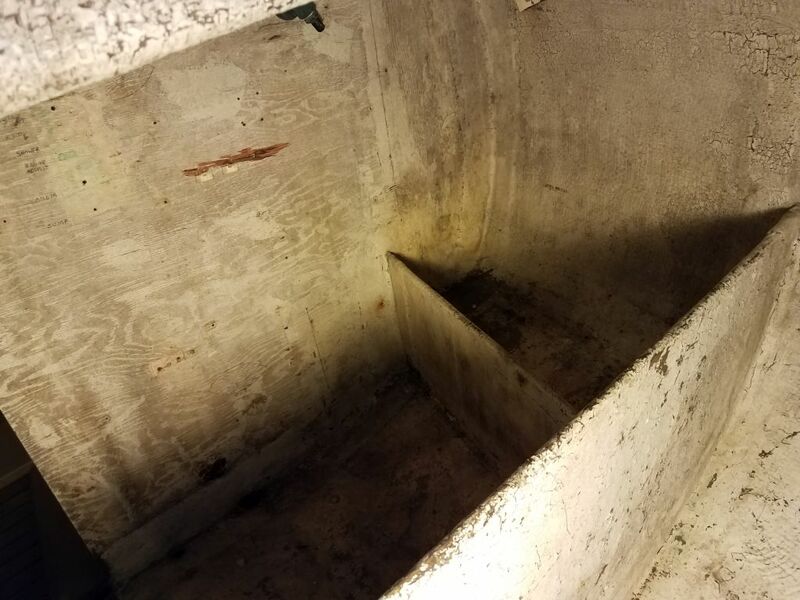 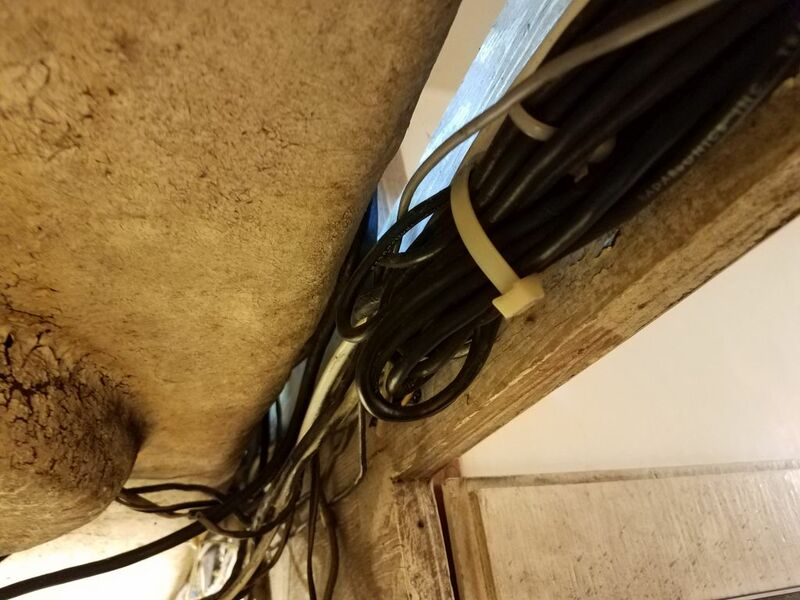 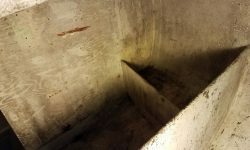 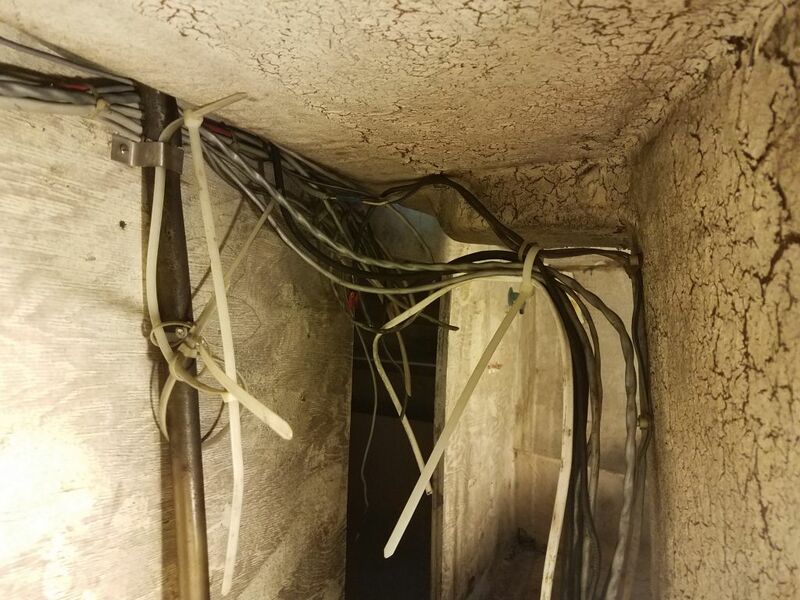 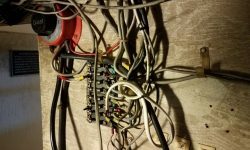 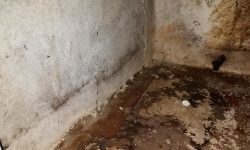 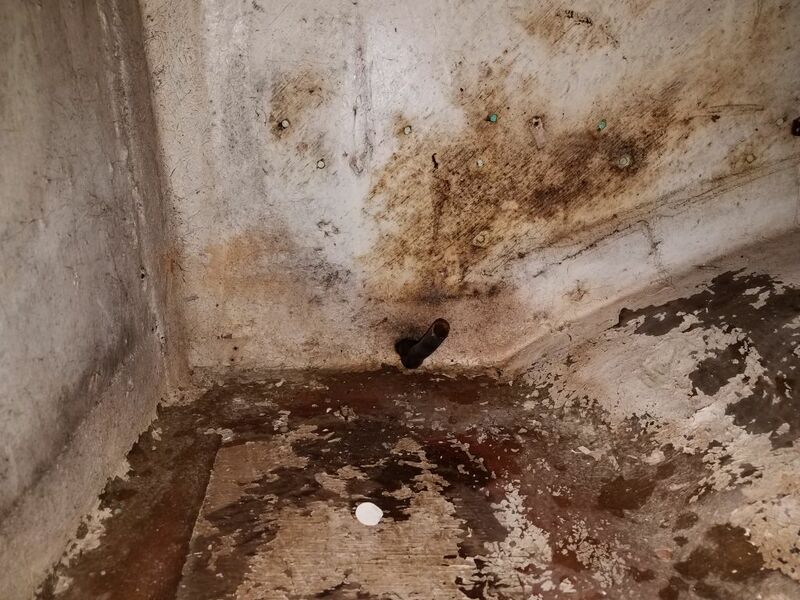 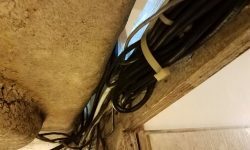 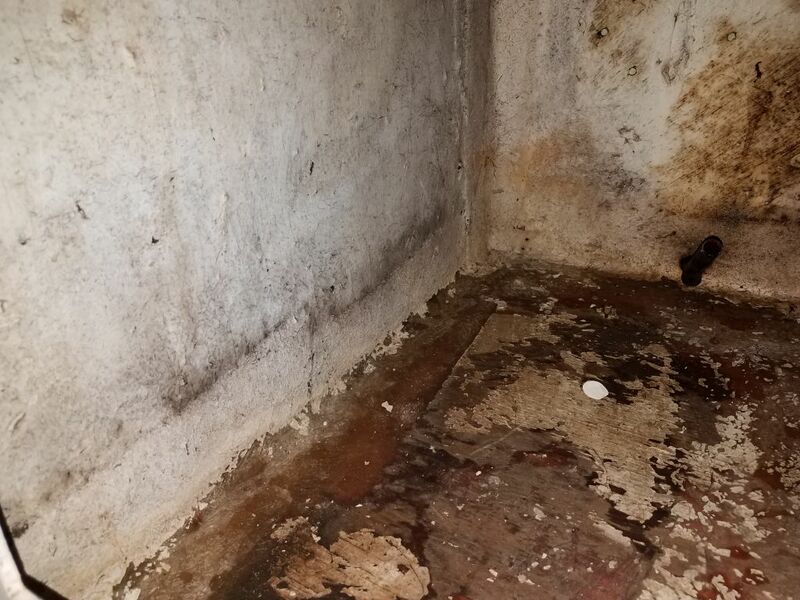 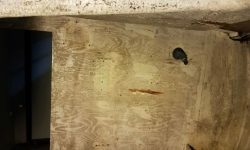 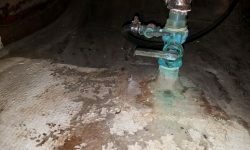 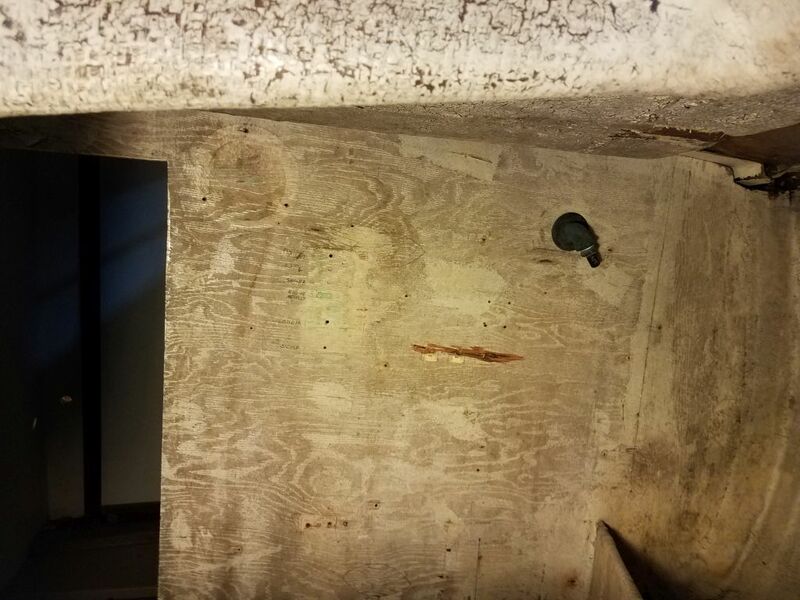 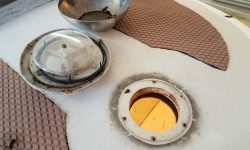 Despite the general appearance of the space, the bulkheads and tabbing, at least at first inspection, appeared to be sound with no immediate issues apparent. 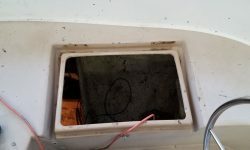 On the coachroof, I removed a solar vent. 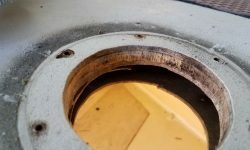 The exposed core in the cutout appeared sound overall. 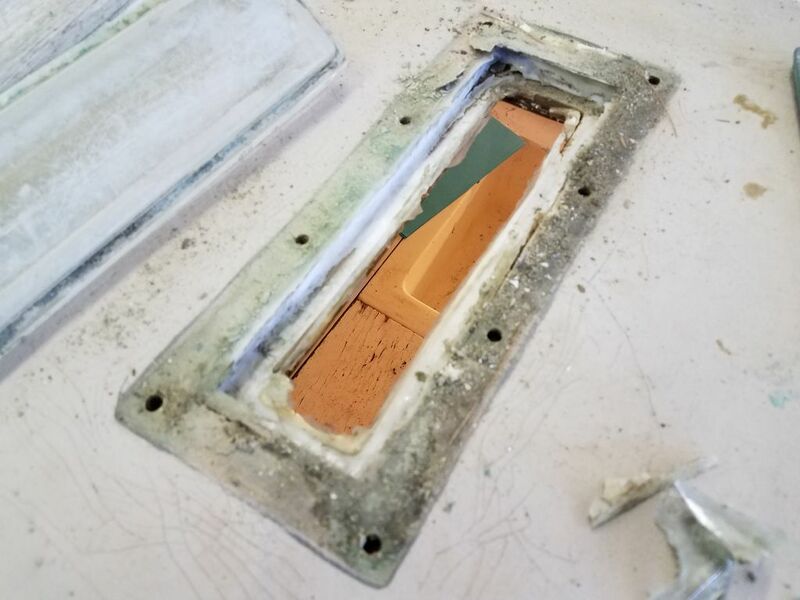 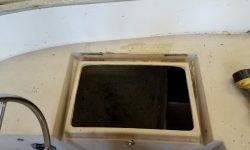 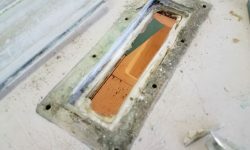 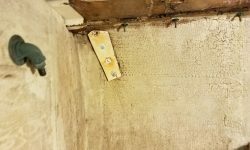 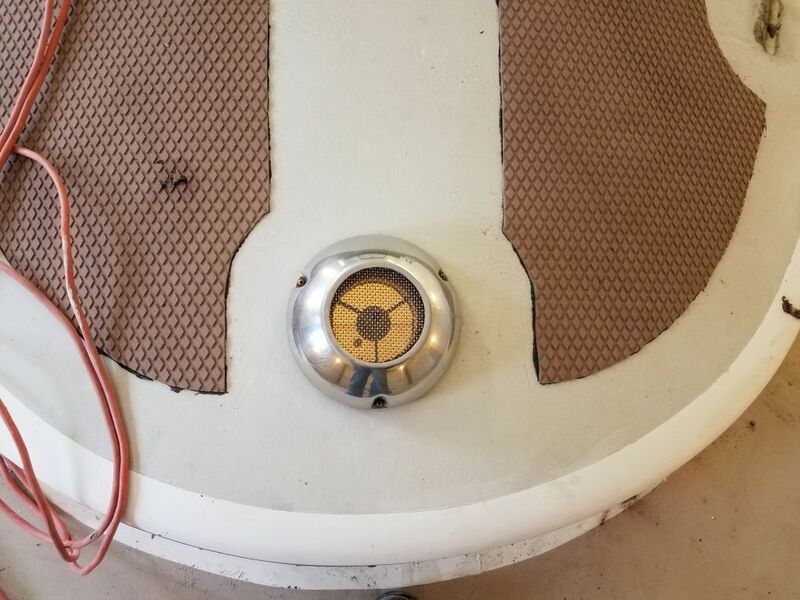 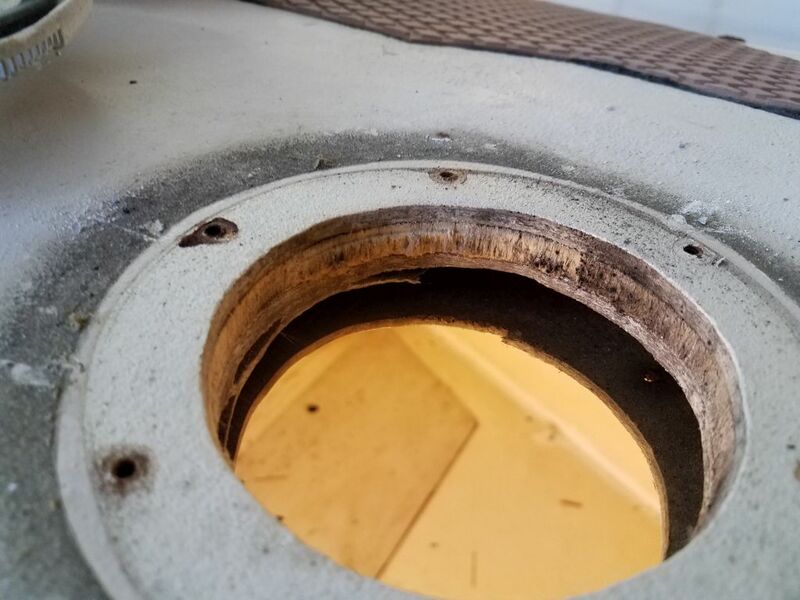 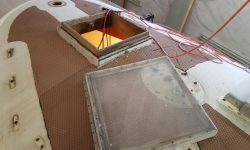 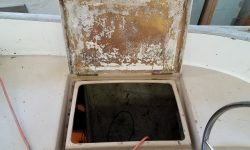 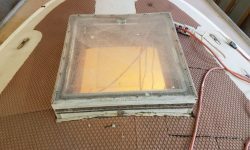 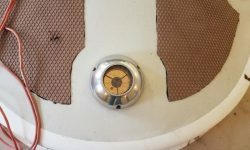 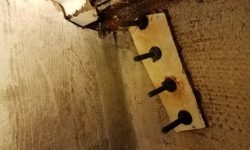 To get it out of the way and prepare for upcoming replacement with a modern hatch, I removed the hinged part of the wooden forward hatch. 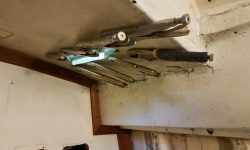 I’d removed the framework in due course. 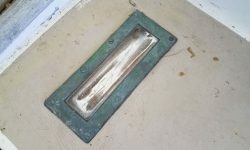 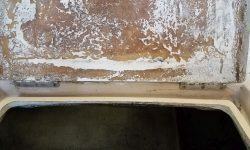 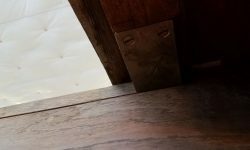 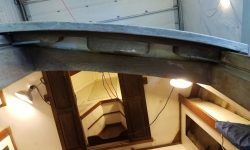 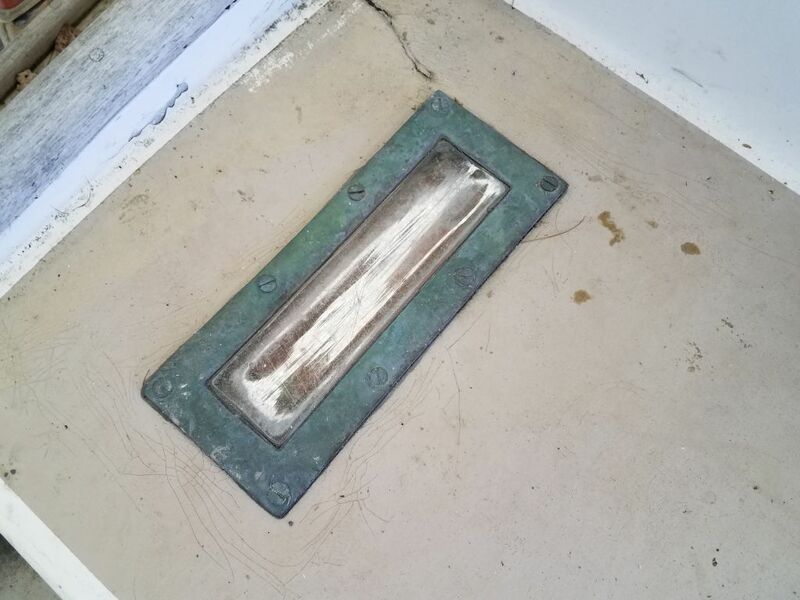 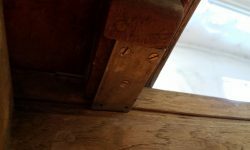 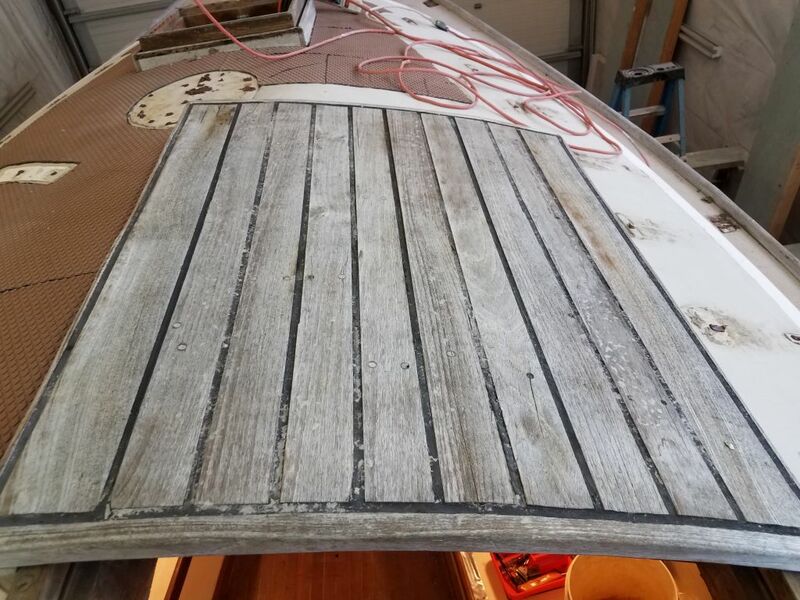 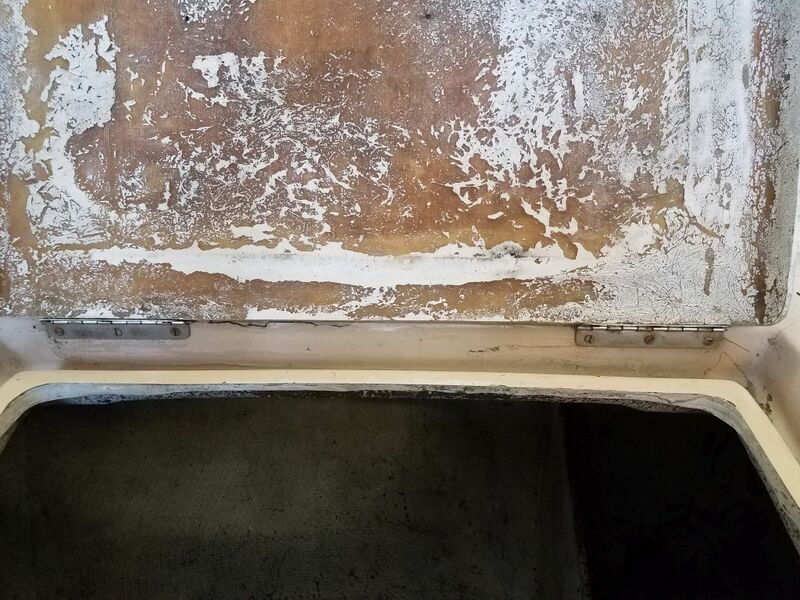 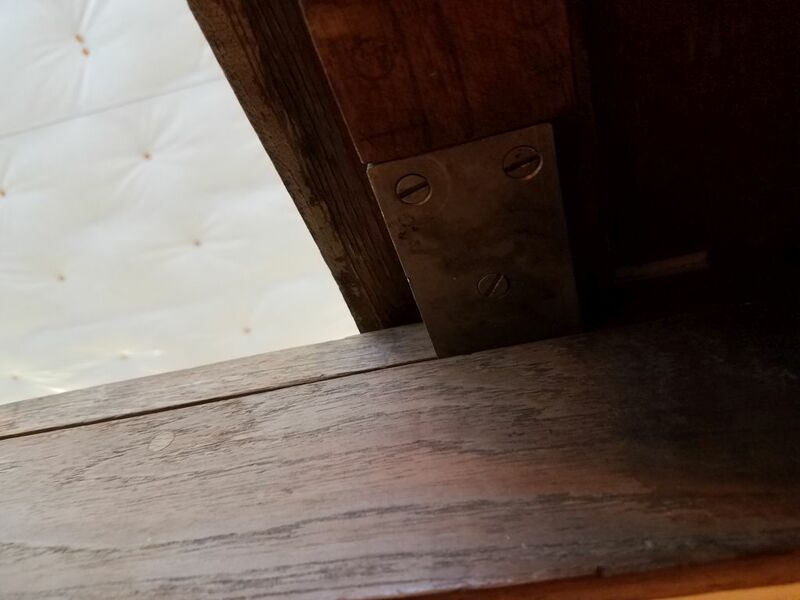 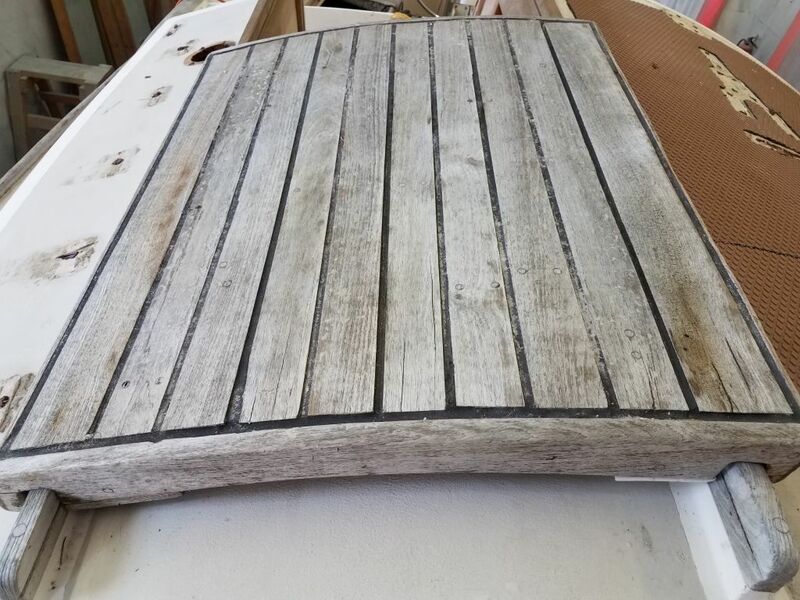 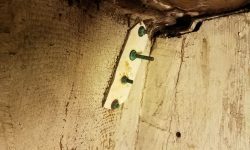 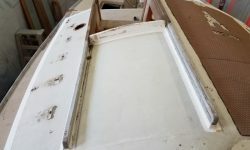 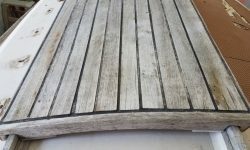 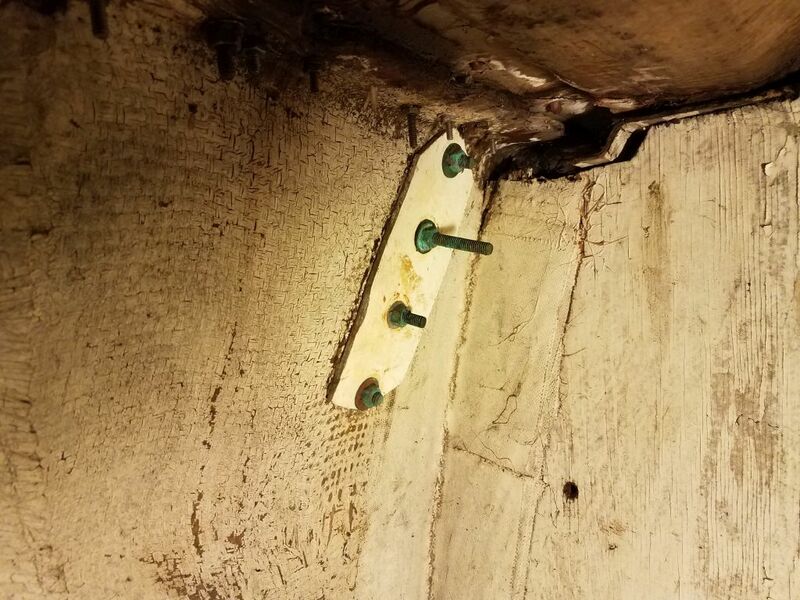 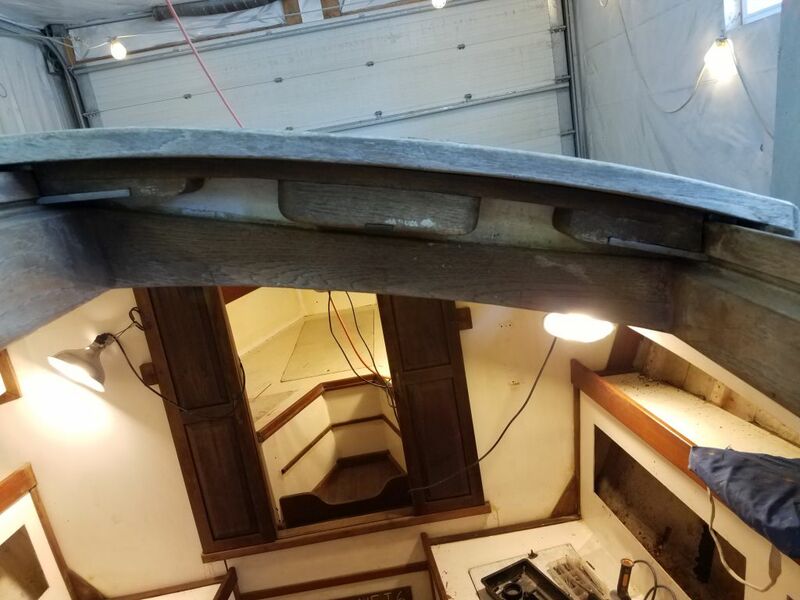 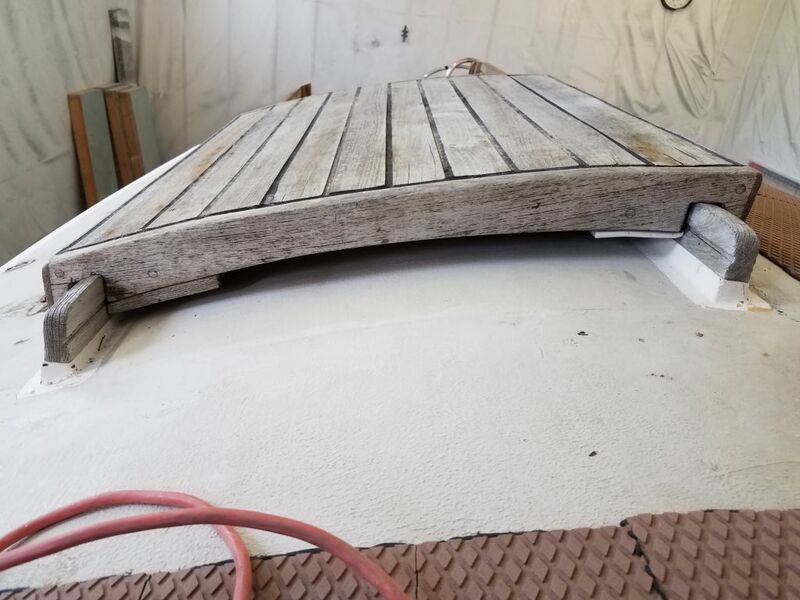 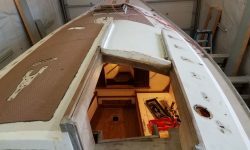 The large wooden companionway sliding hatch was secured in place with two metal plates, which rode in grooves in the side rails. 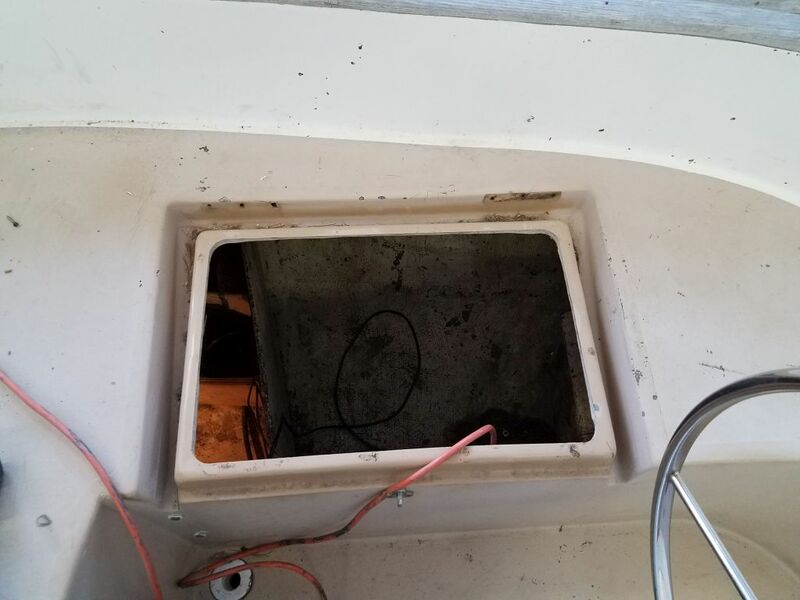 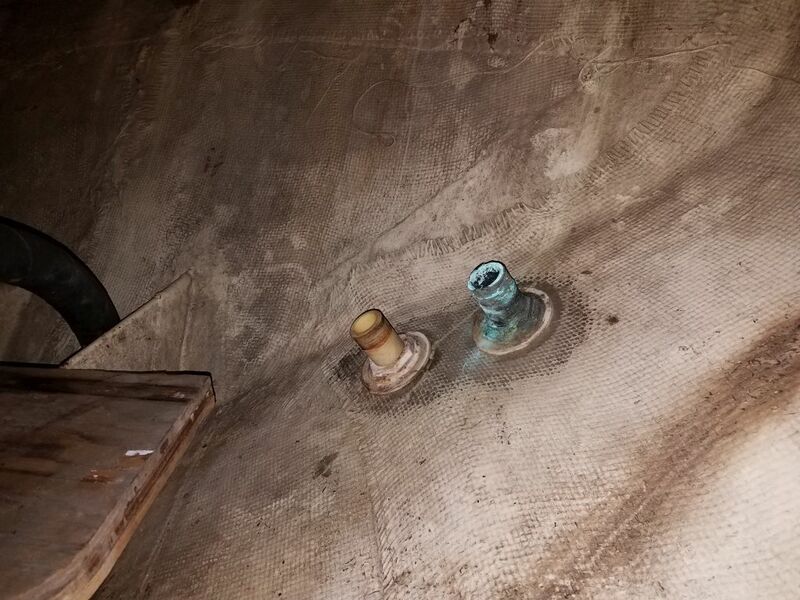 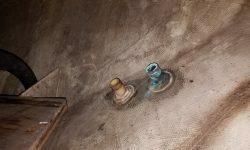 I removed these, and removed the hatch. 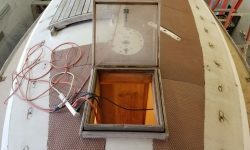 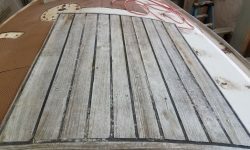 The wooden hatch appeared to be built from a plywood base with teak overlay, and the external teak planking was in marginal condition. 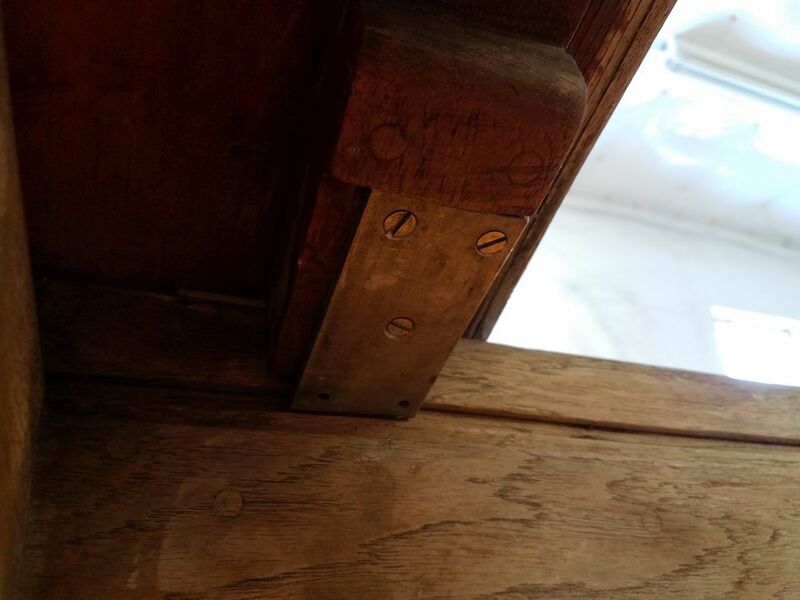 The solid teak rails and related trim was in weathered but generally sound condition, with some minor damage noted. 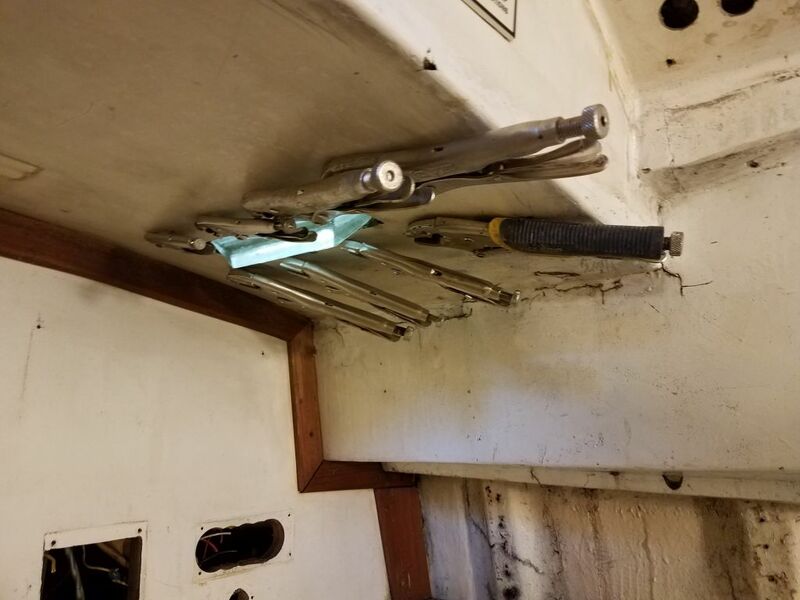 In the cockpit, to free up access to the lockers, I removed the locker lids, which were barely secured with simple hinges. 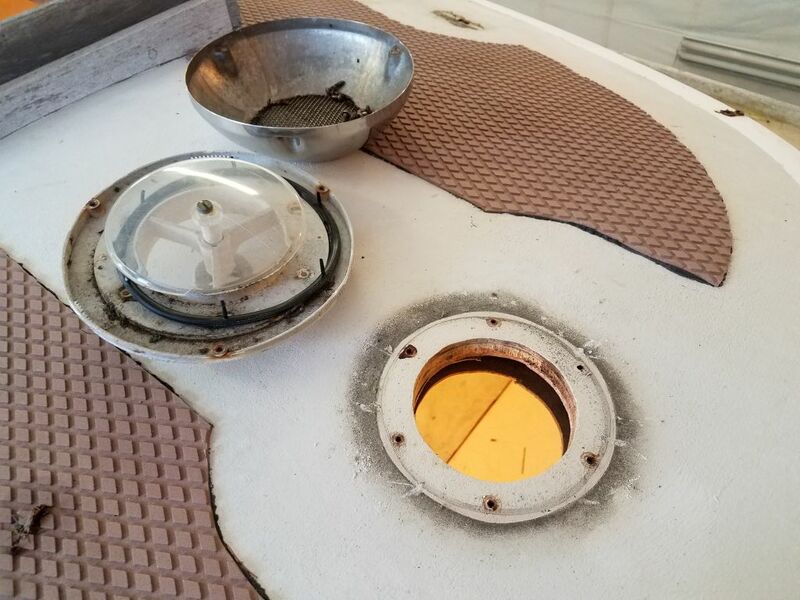 The hatches themselves were fairly flimsy and could benefit from some reinforcement, but were otherwise sound enough, but the means of attachment to the boat would require some work. 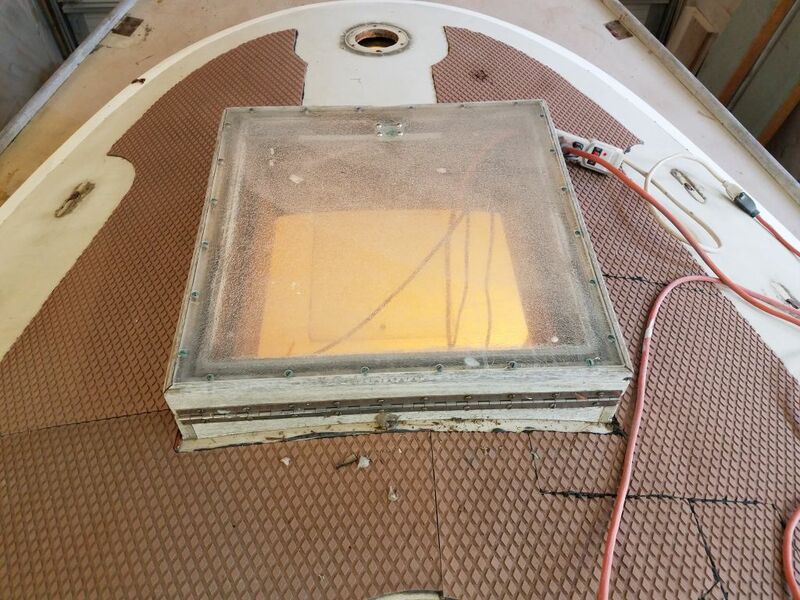 At the forward end of the cockpit, beneath the bridgedeck, was an expansive display of ancient electronics, including the engine control panel, all covered in an elaborate frame and smoked acrylic cover. 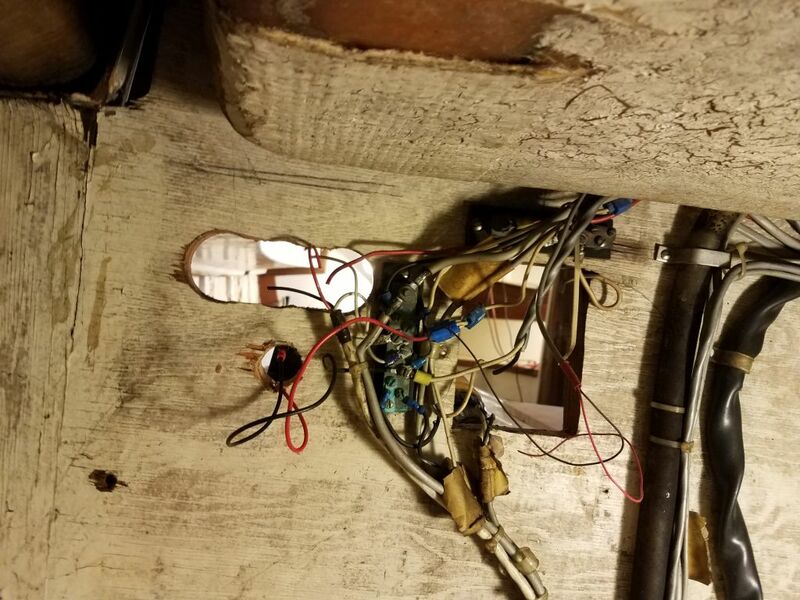 I removed the cover and frame, then removed all the instruments. 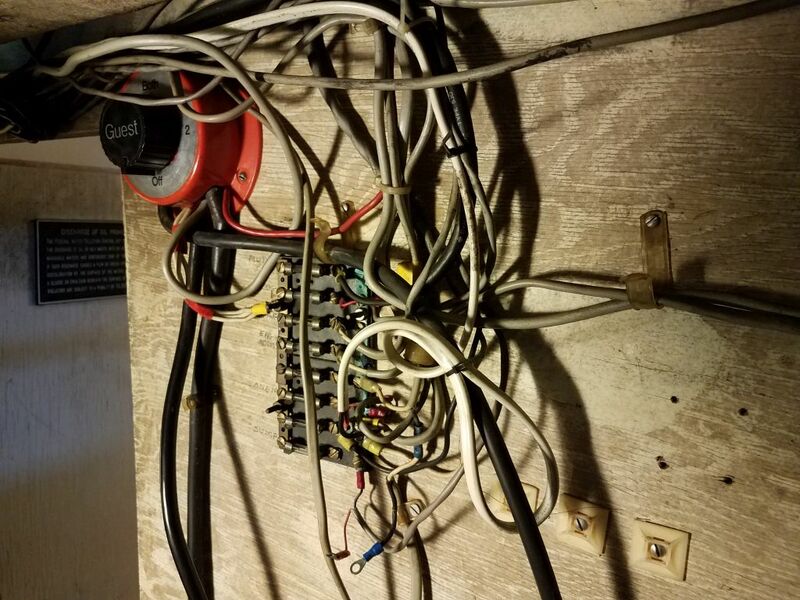 I’d already clipped the wires from the other side during earlier work. 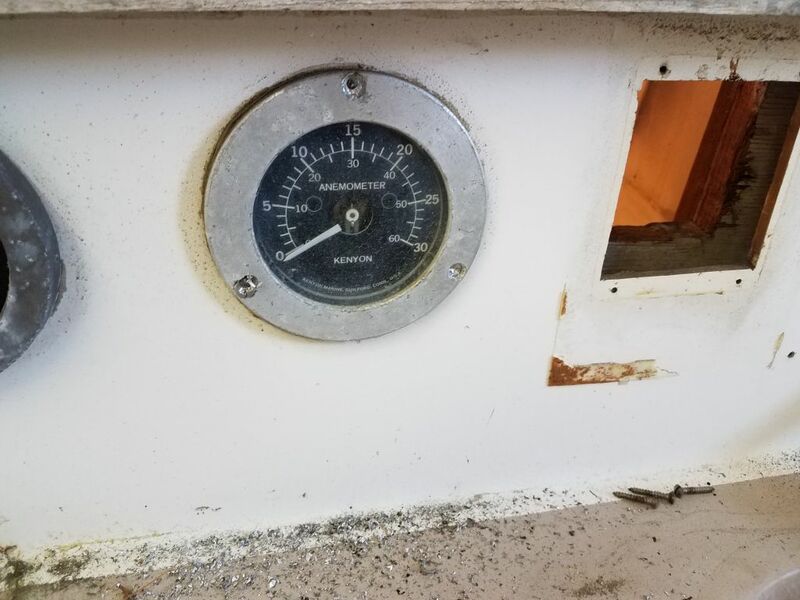 I had to drill out the screw heads on the anemometer, as this unit was bolted in place and the nuts inside were too close to the instrument itself to get any sort of wrench on. 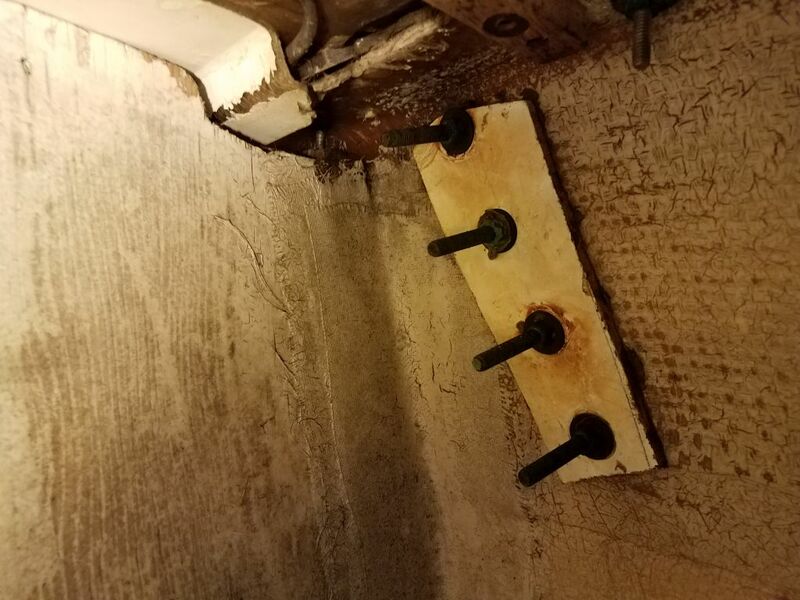 I’d no idea how someone managed to tighten them down in the first place. 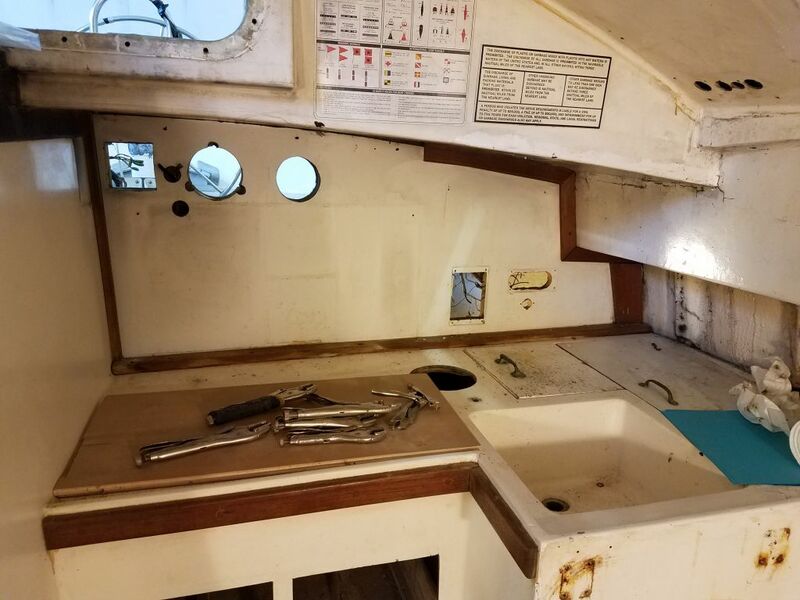 Now I turned to the engine room, located beneath the cockpit and accessed through a door at the aft side of the head or through the cockpit lockers. 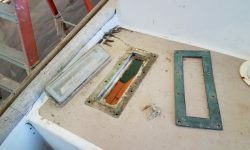 The cockpit locker areas, while generally expansive, were difficult to work in because of a series of tall, narrow dividers well-glassed in place–handy for securing locker contents, but tough to work around and surprisingly limiting of access to some areas. 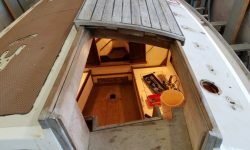 While access to the engine itself was basically good and offered far more room and availability than the tiny engine rooms on many boats, there were still numerous impediments to the space, and there was no direct–or even close to direct–overhead access to the engine for lifting and removal. 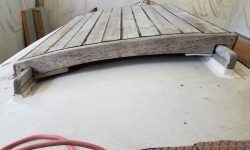 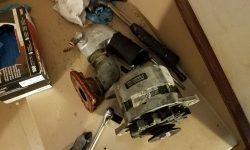 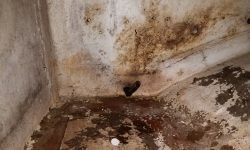 All the while, however, I was turning over the process in my head, and though removal would be challenging, I was pretty sure I had a workable plan. 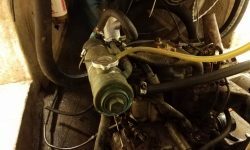 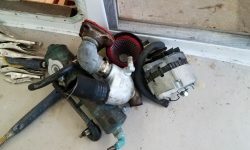 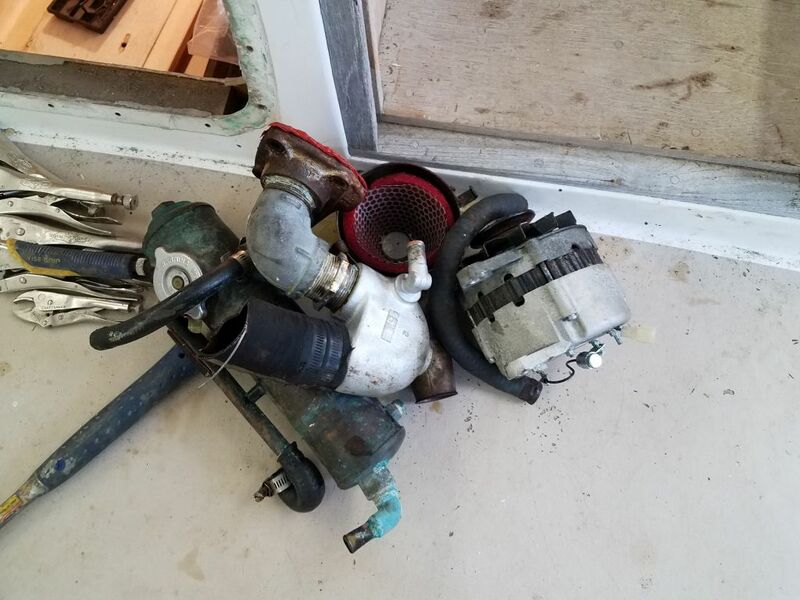 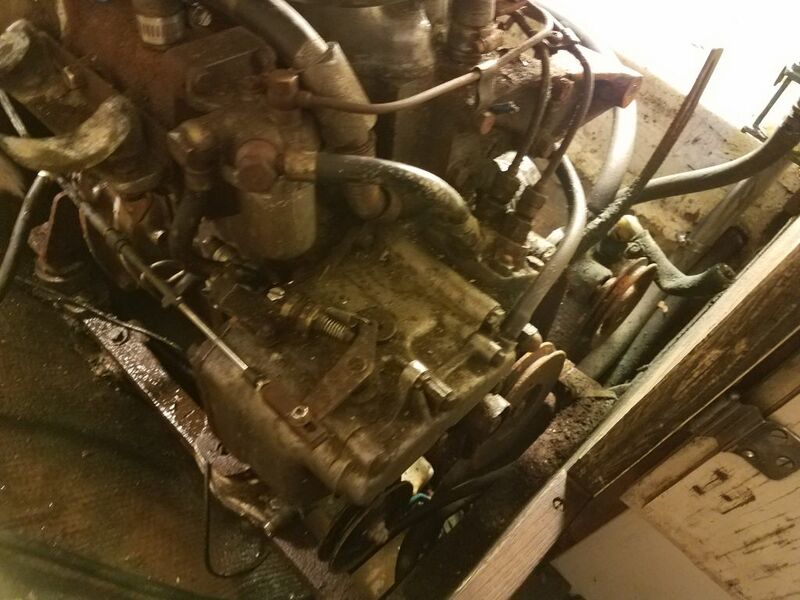 The owner planned on repowering with an electric motor, so at least I’d only have to get the old engine out and not worry so much about shoehorning in the replacement. 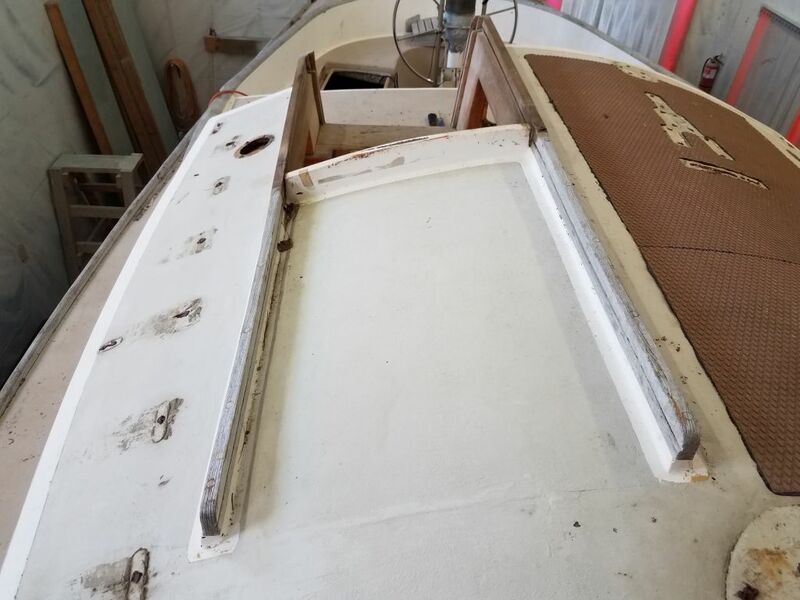 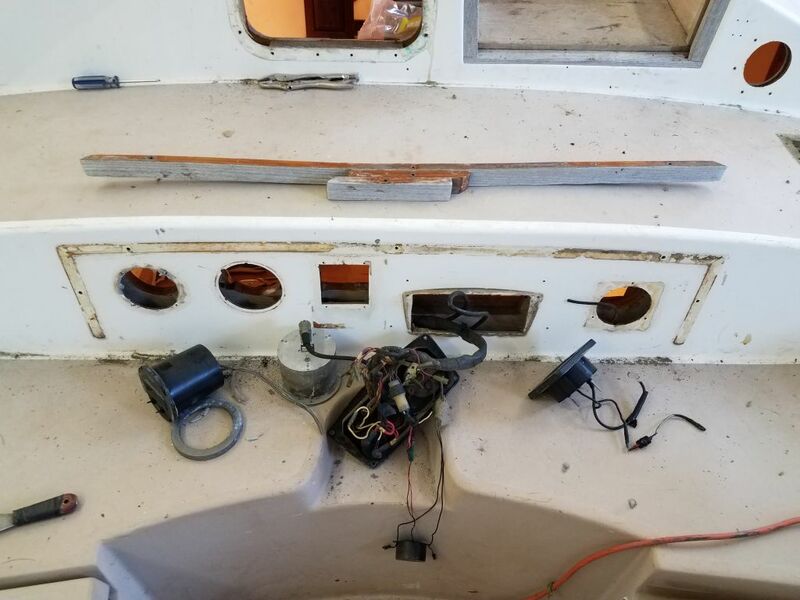 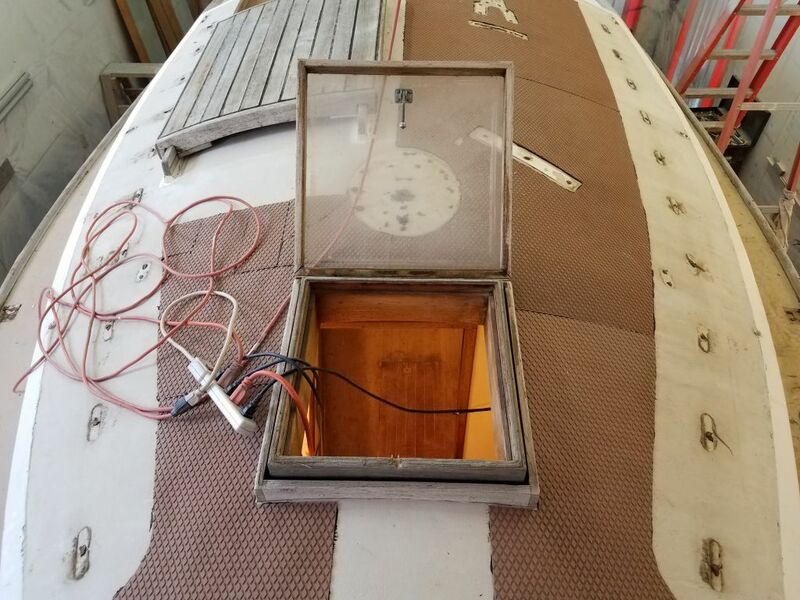 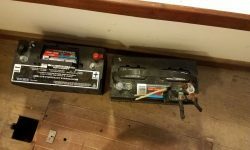 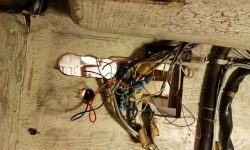 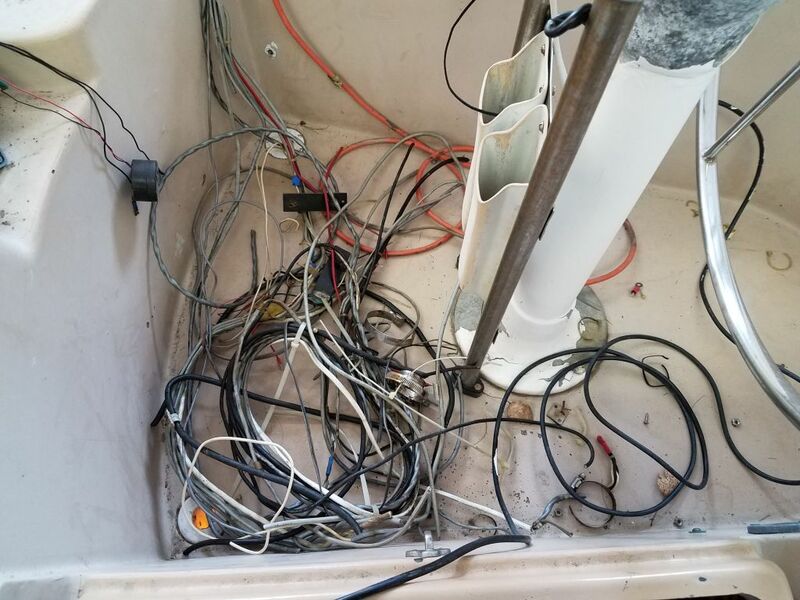 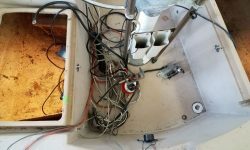 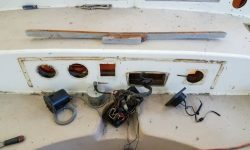 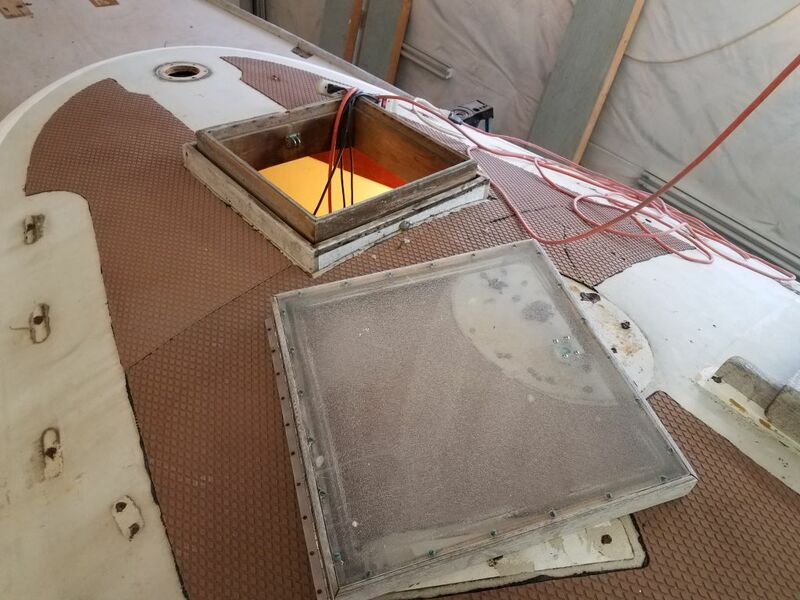 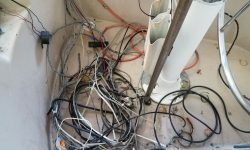 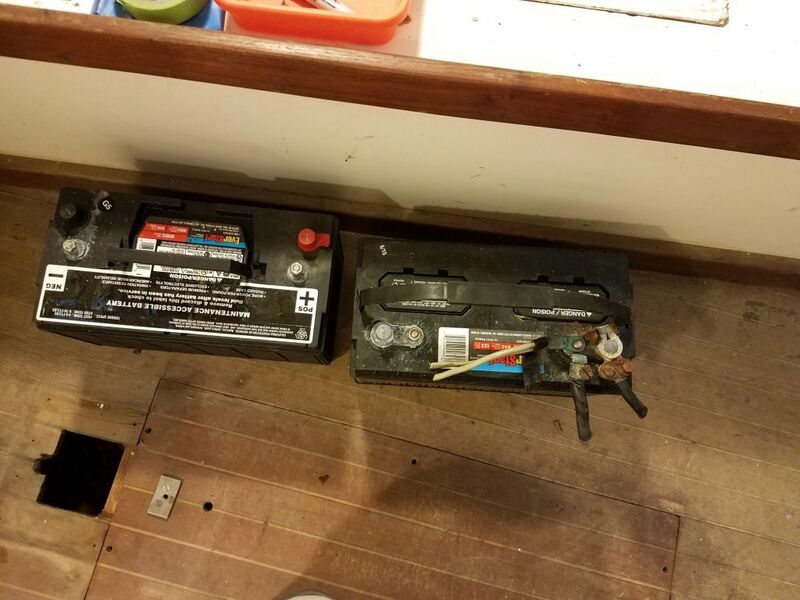 On the starboard side forward were two existing batteries, battery switch, and related wiring, and starting here I systematically cleared out the space, removing the batteries, clipping cables to the engine, and dismantling the wiring on this side of the boat. 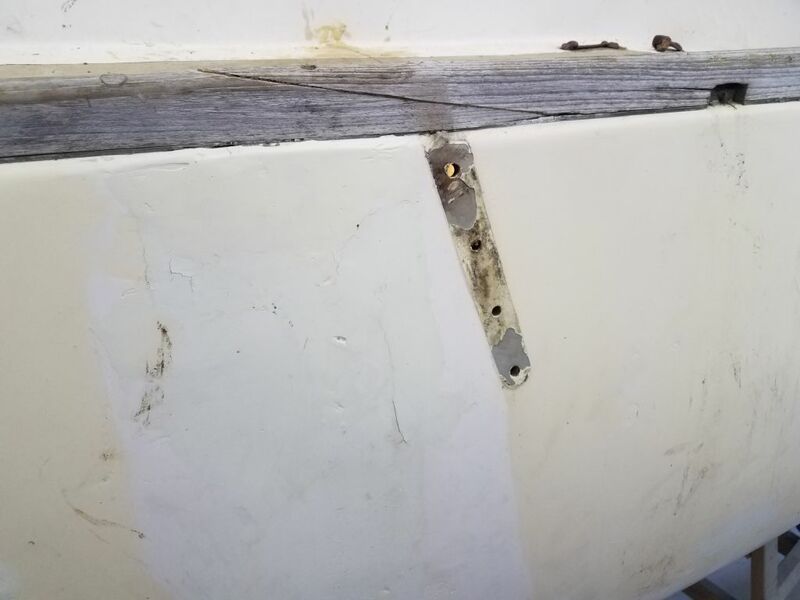 While I was there, I also removed the nuts from a final chainplate set located here and removed the bronze chainplate from the hull. 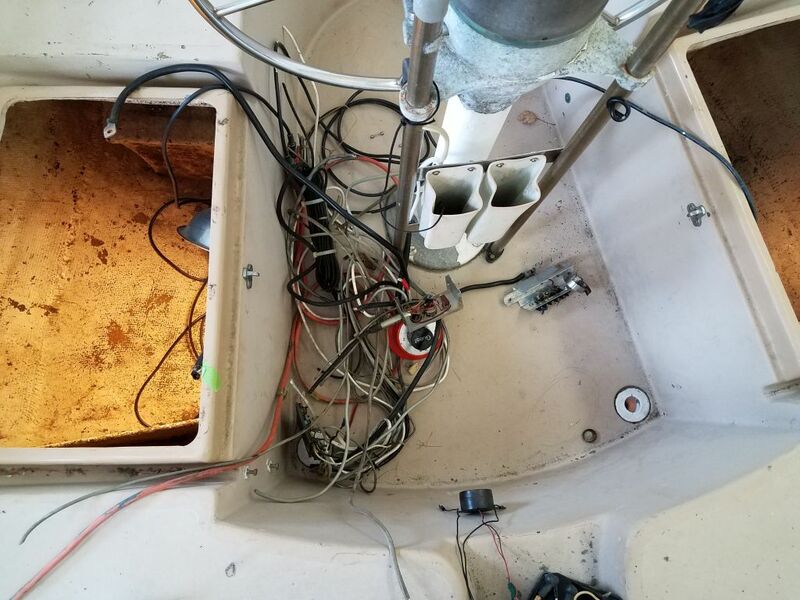 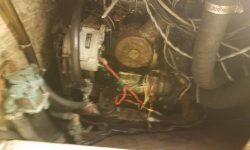 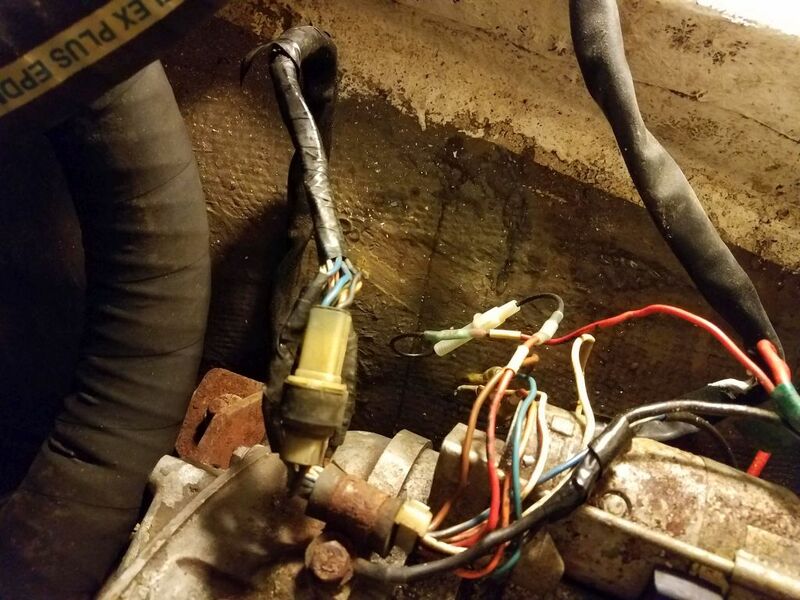 Moving over to the port side, I removed all the old wiring from this side, and cleared out anything else I could, including removing the fasteners from the manual bilge pump and removing bilge and exhaust hoses from the space. 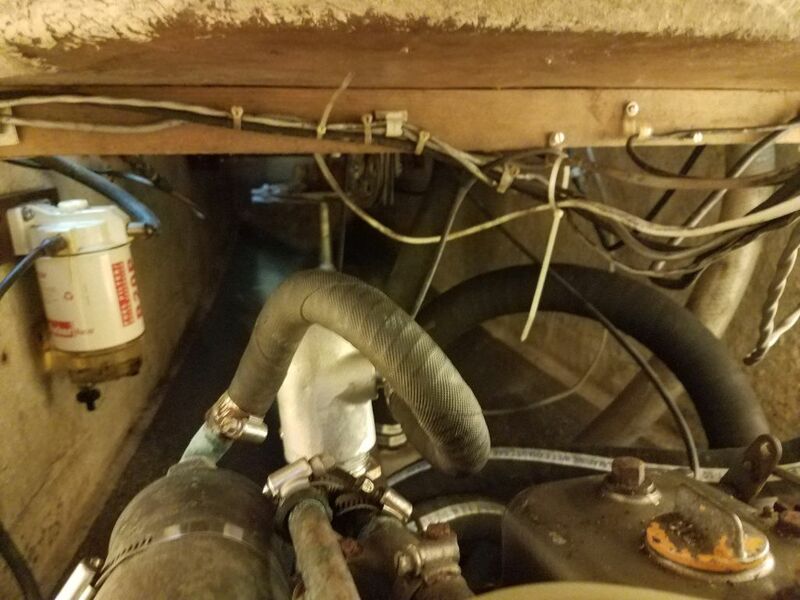 I’d expected to be able work on the port side of the engine while on this side, but found that the configuration of the cockpit locker dividers was such that access was nearly impossible from a practical standpoint, and I figured I’d have better luck coming in from the other side and lying atop the engine as needed. 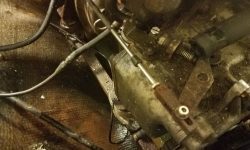 Here also, I removed the after chainplate. 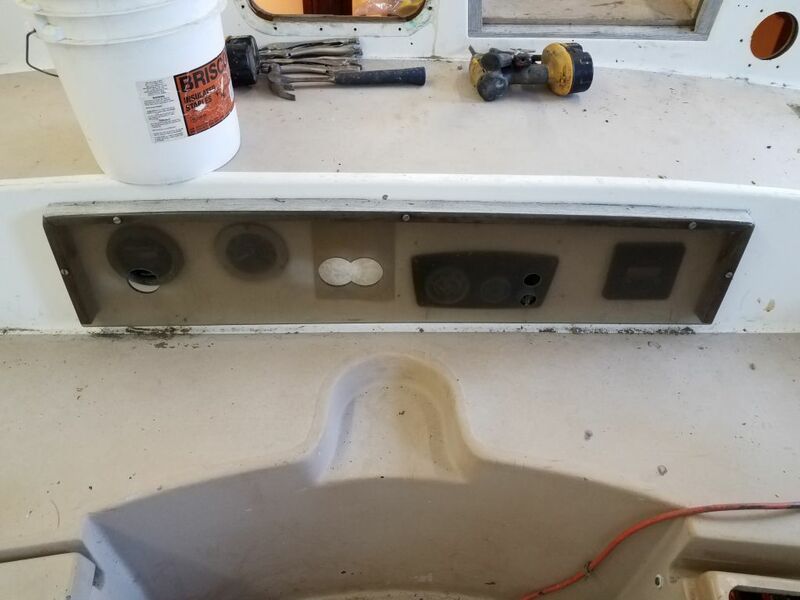 I see that I forgot to get an “after” photo of the bulkhead when I’d removed the wiring. 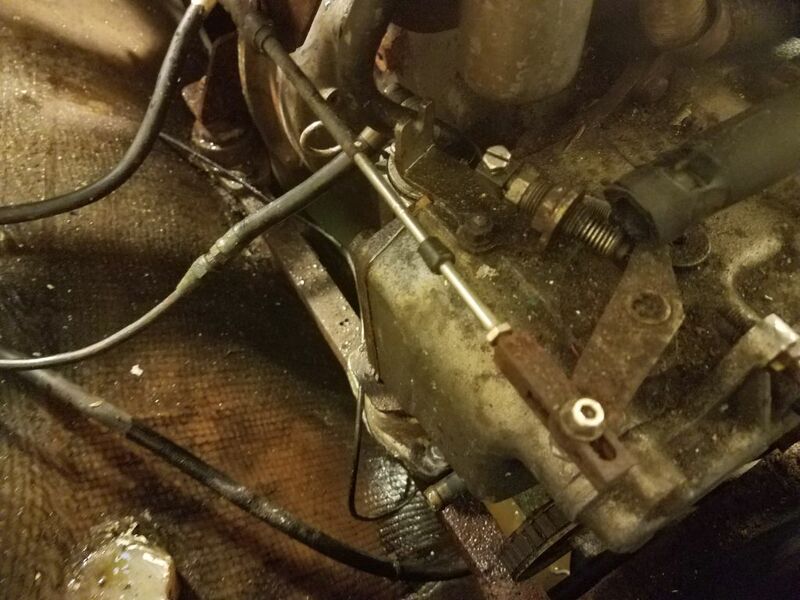 Back on the other side, and with most of the wiring out of the way, I began cleaning out the rest of the space, removing scupper hoses (these were pleasantly easy to remove) and stripping various parts from the engine to reduce its size for removal, including the heat exchanger, exhaust elbow and riser (these were nearly new and were easy to remove), control panel wiring harness, gear and throttle cables, and the alternator. 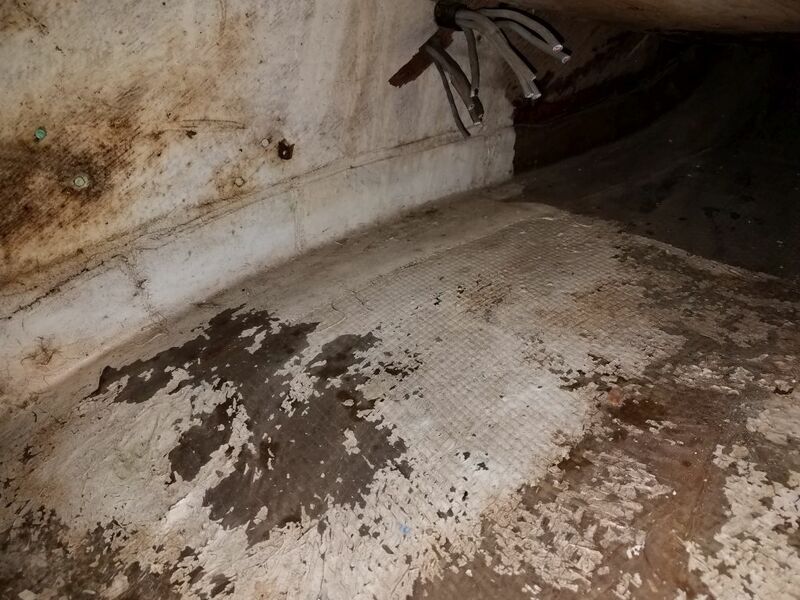 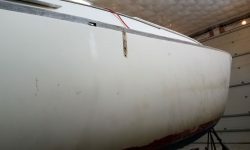 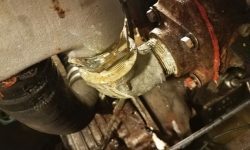 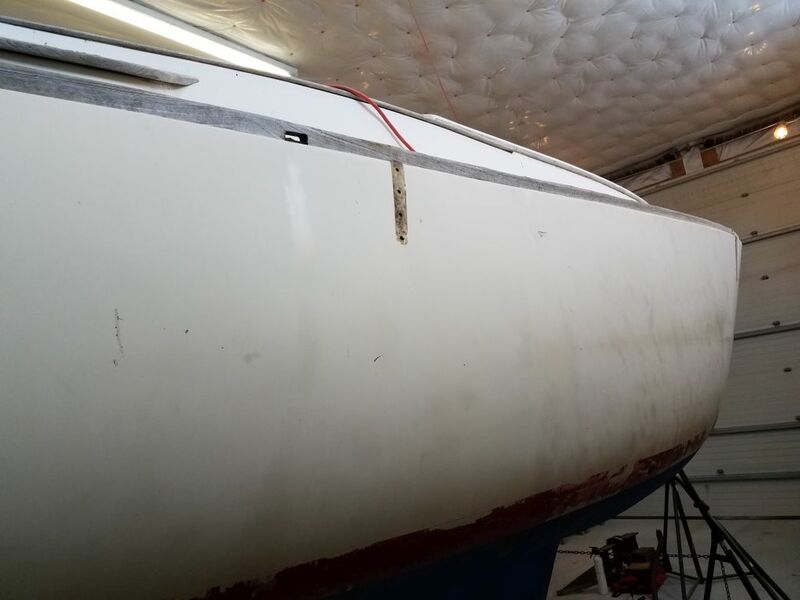 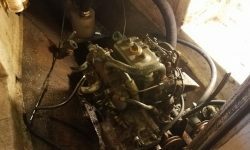 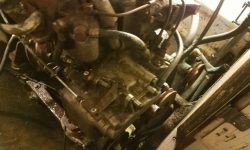 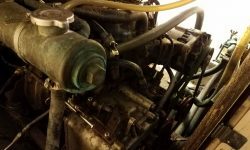 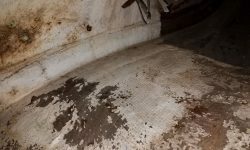 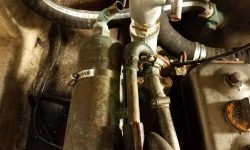 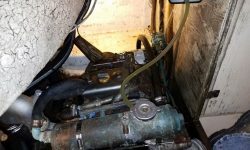 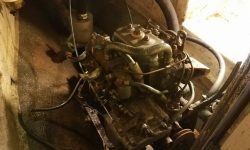 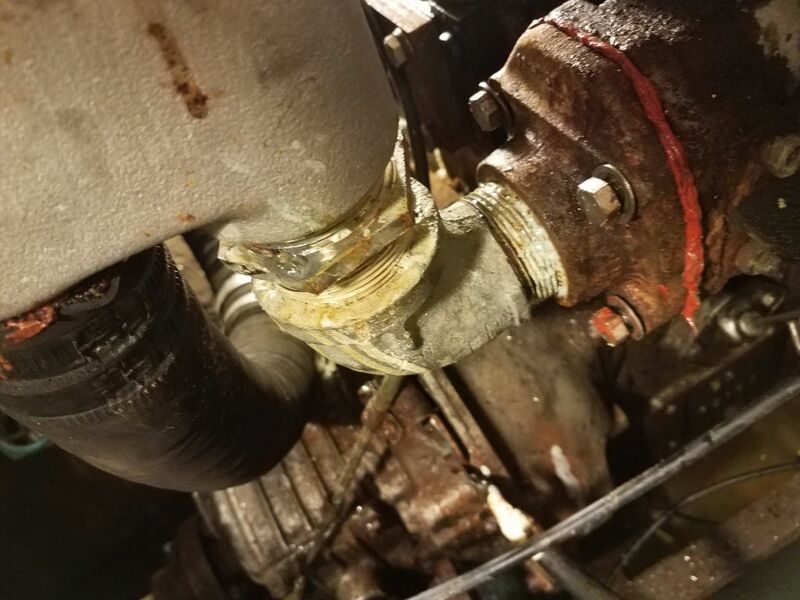 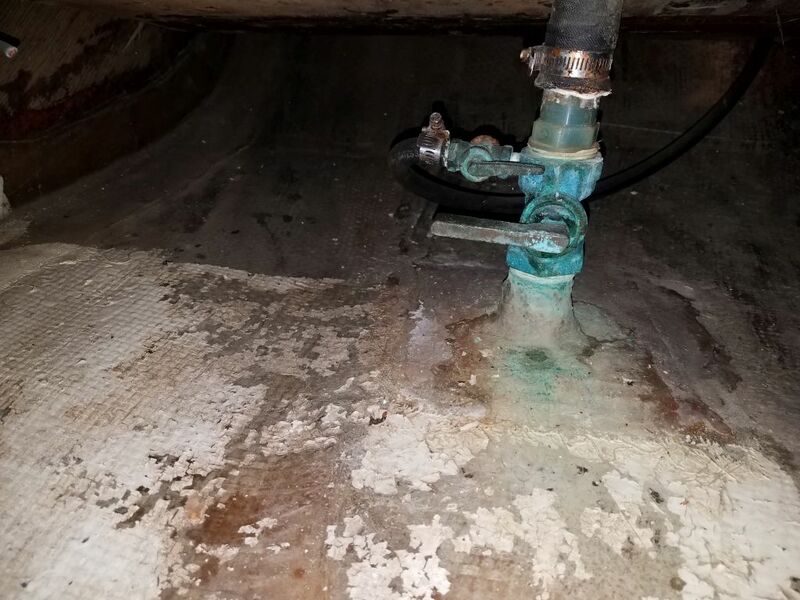 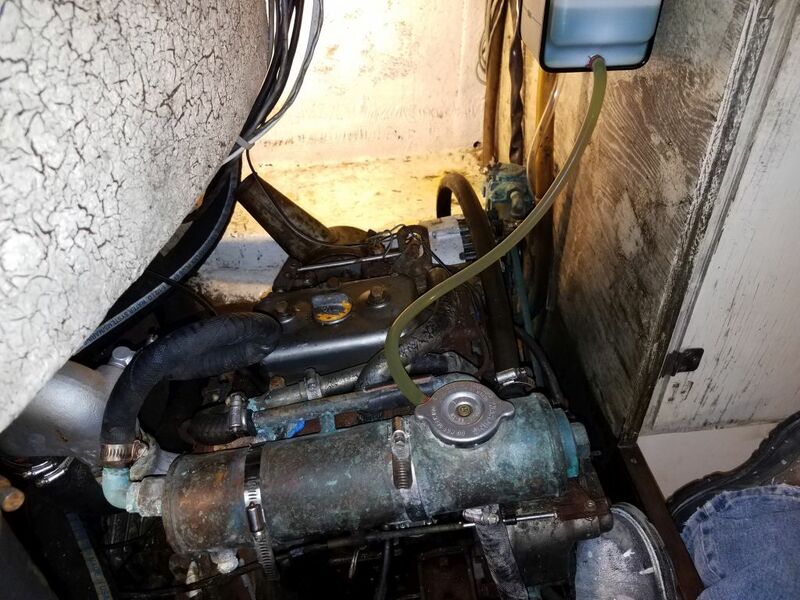 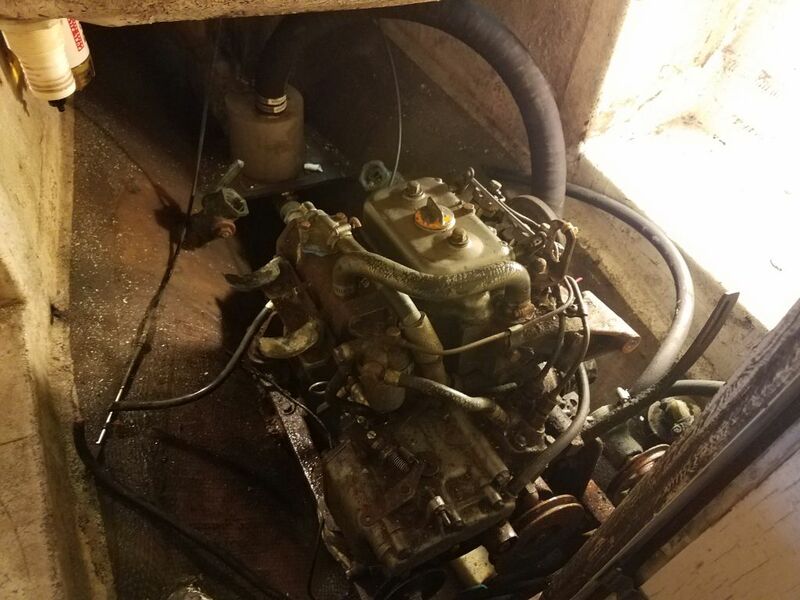 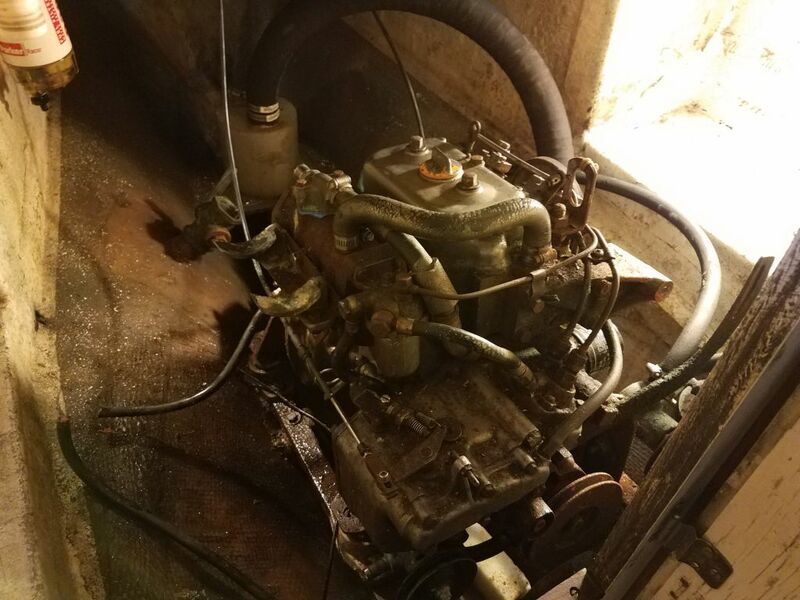 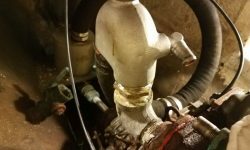 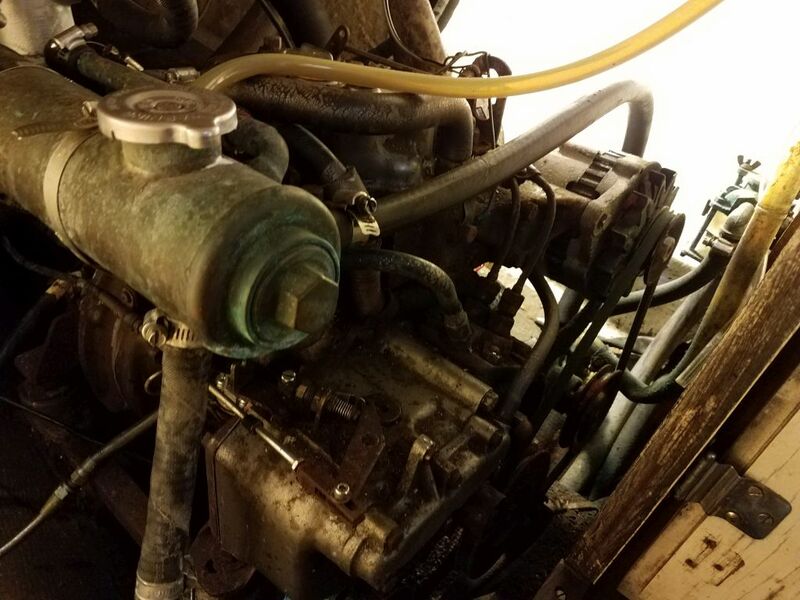 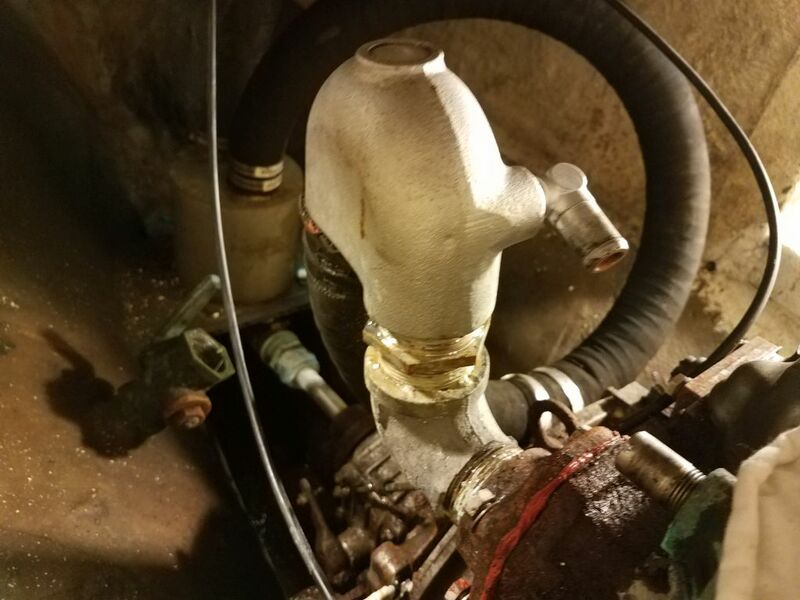 This began to open up the space considerably, and considering the condition of the rest of the boat, the engine itself seemed surprisingly well-maintained given its age, though starting from scratch in this space was most definitely the only answer. 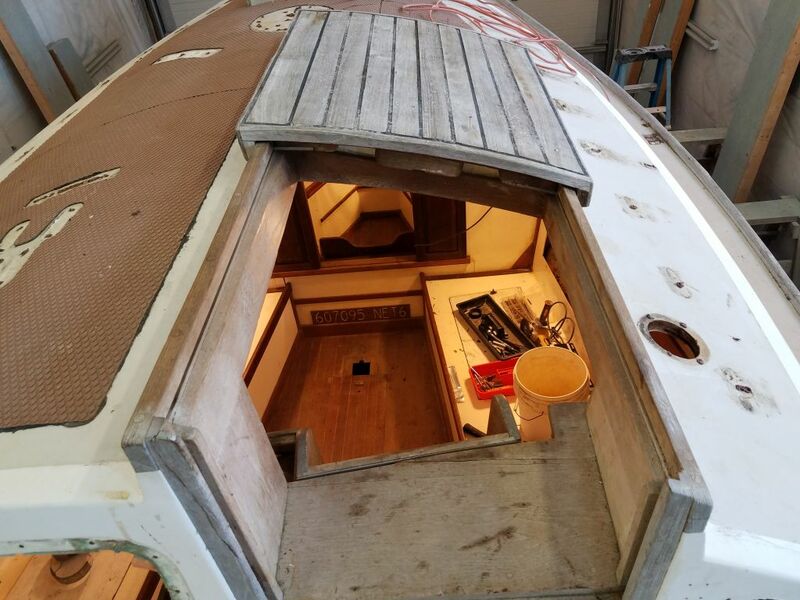 I’d continue work in the space next time as I strove to get the boat cleaned out as soon as possible. 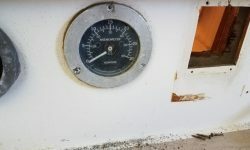 0600 Weather Observation: 18°, mainly clear with some high clouds. 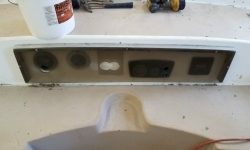 Forecast for the day: Increasing clouds, mid 30s.